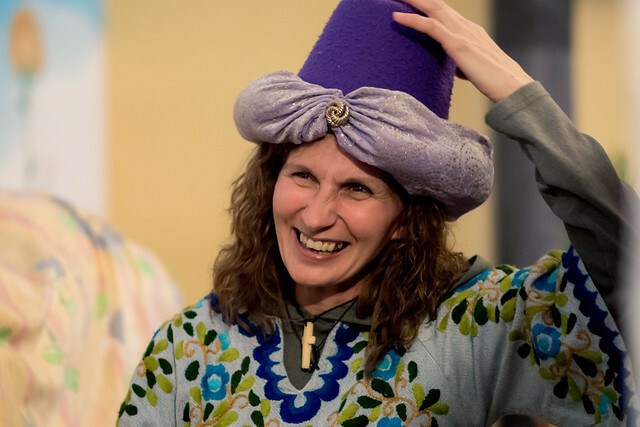 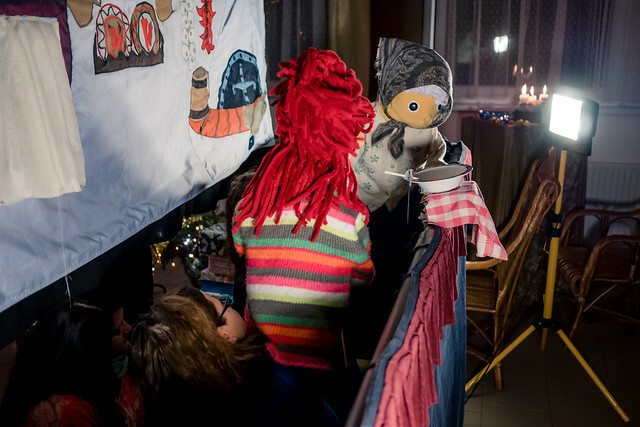 Before getting back to puppet ministry last Monday, we held our Christmas worship service in Petofibanya on Sunday evening. 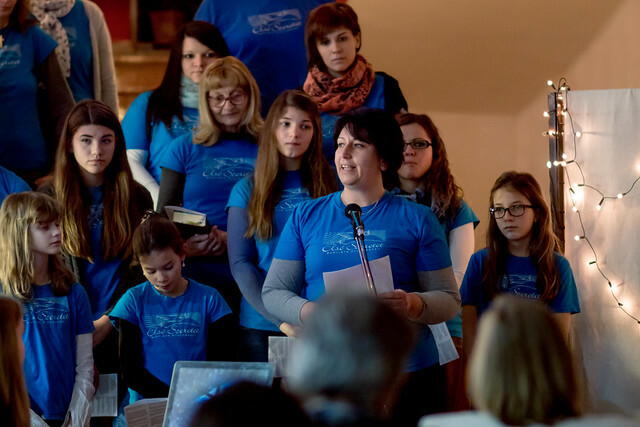 We were thankful to see visitors like the local middle school’s principal and others that church members personally invited attend this celebration with us! 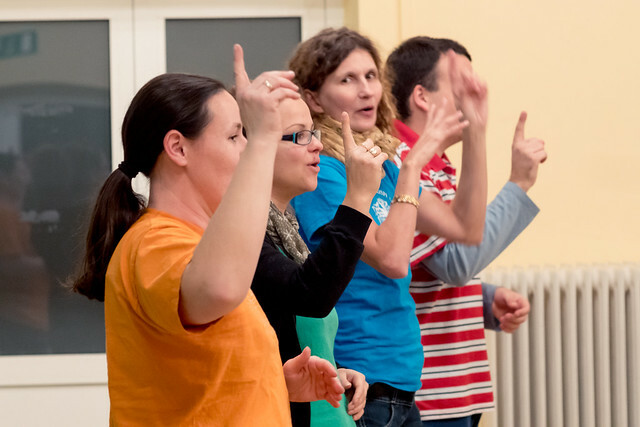 Above: Church members practiced for weeks for our Christmas choir. 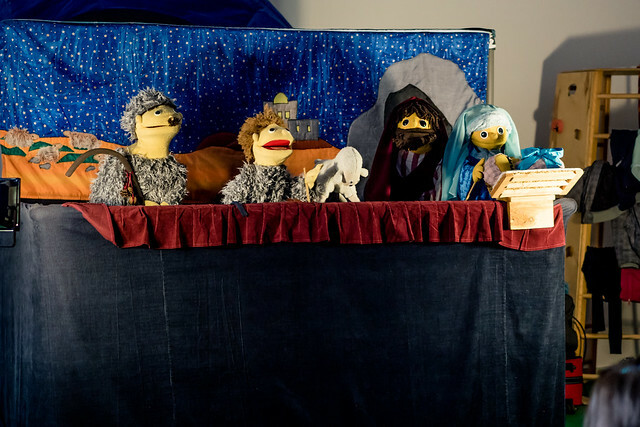 With songs and excerpts read from God’s word, we were able to share the Christmas story. 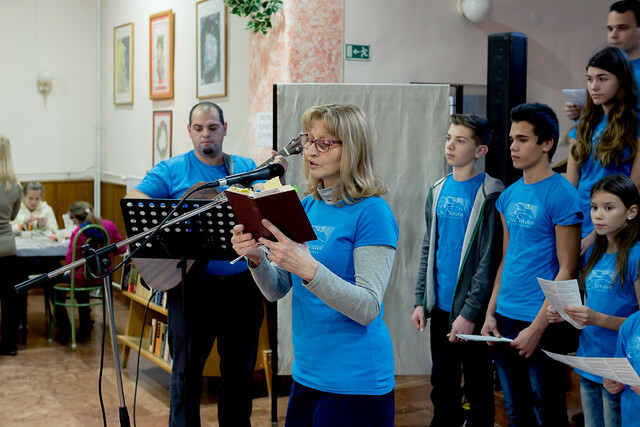 Above: PI Teammember Tom who has been with us in Hungary a little over a year was able to share his testimony giving glory to the faithfulness and grace of God. 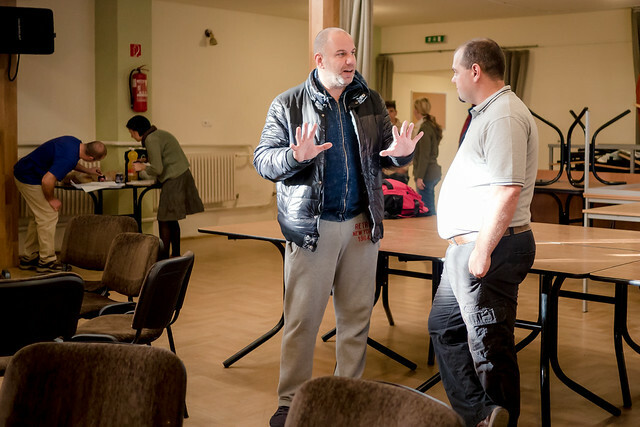 Bogi, who was saved as a result of one of our English Club outreaches did a great job translating for Tom. 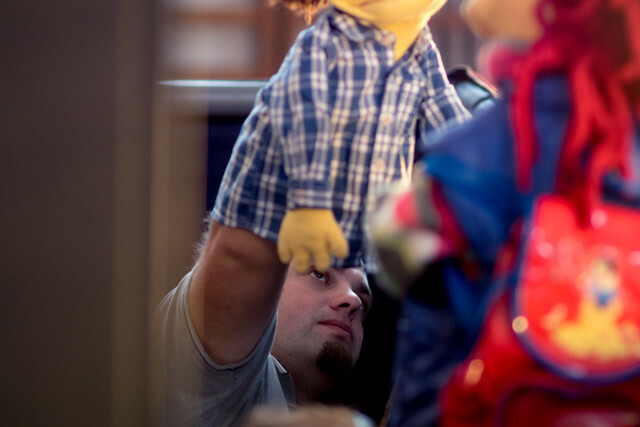 Above: We were back out doing puppet ministry on Monday with our first visit being our hometown’s preschool. 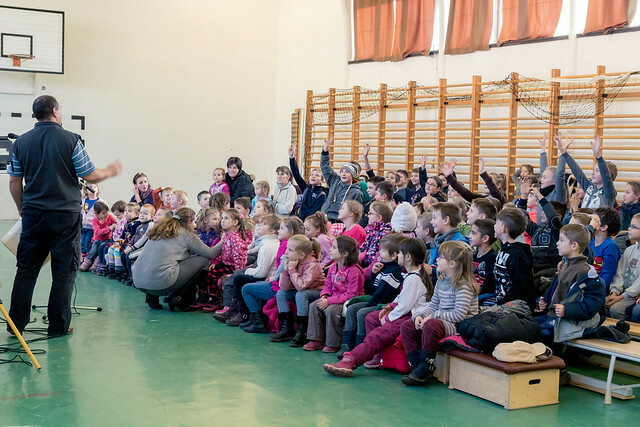 Our daughter Ziva (who attends this preschool) is pictured above throwing the snowball. 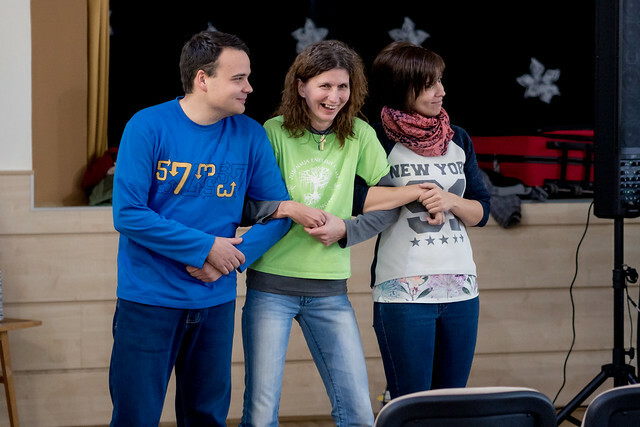 Our next stop for Monday was Petofibanya’s middle school where we have many connections with these kids through VBS, little league baseball and other ministries we hold throughout the year in our hometown. 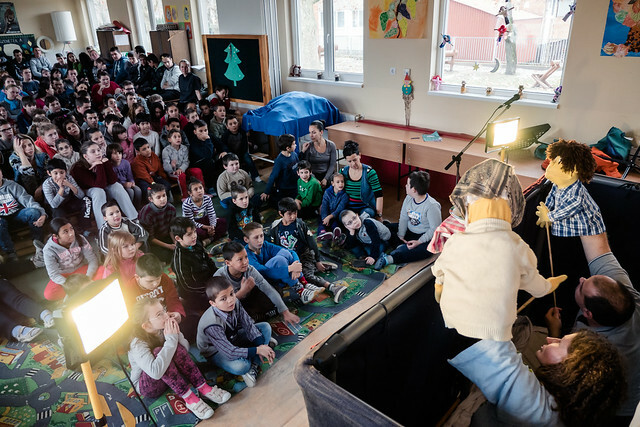 On Tuesday our first stop was the town of Szirak. 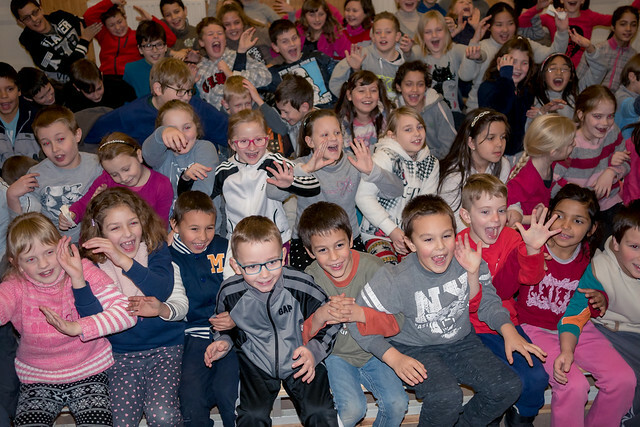 Last year we learned that the principal of this school had just been diagnosed with cancer and would be going through treatment. 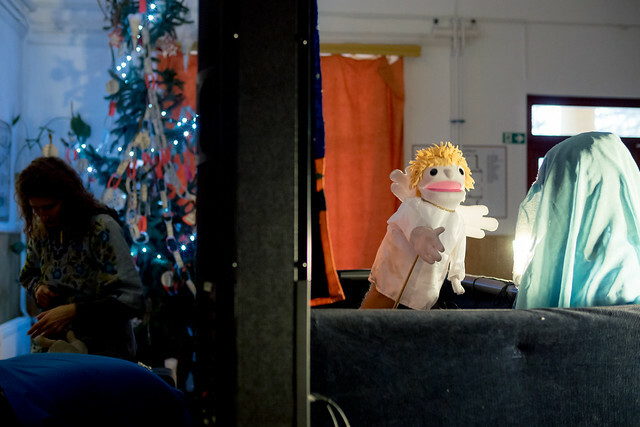 It was good to see him doing well this year and he remembered our prayers for him in his office. 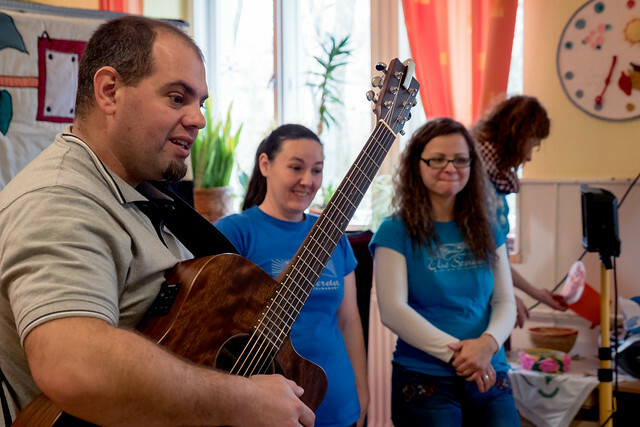 Before leaving, we were able to pray for him again for his complete recovery. 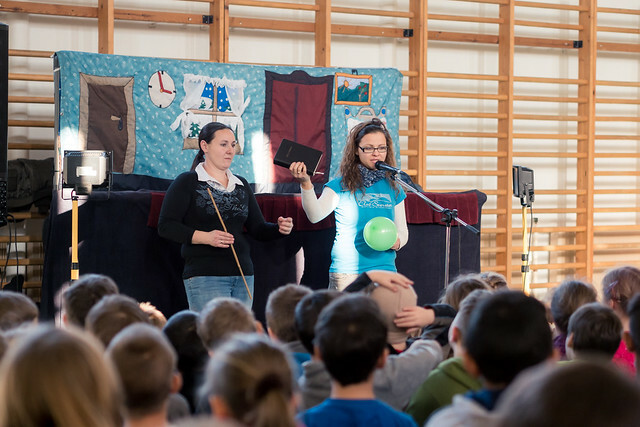 Above: What a blessing to be able to talk about the Bible in public schools and share the Gospel openly. 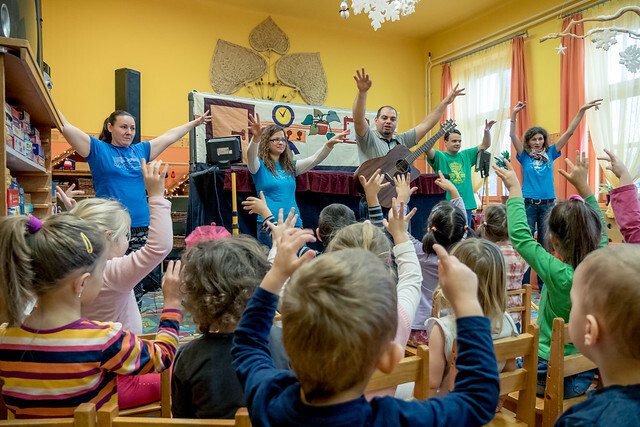 Praise God for this open door in Hungary! 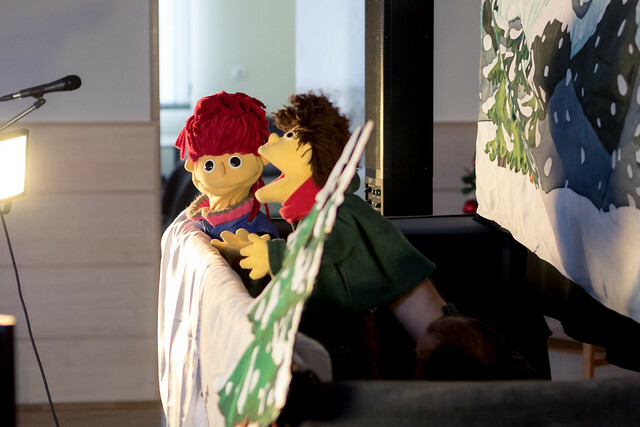 Above: Arnold to the rescue. 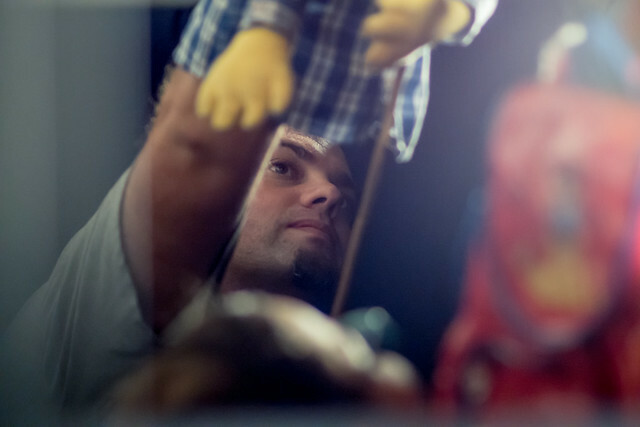 With one of our other puppeteers becoming sick and then having to stay home to care for her son who also became sick, we were very grateful for Arnold to rotate into the team and fill in. 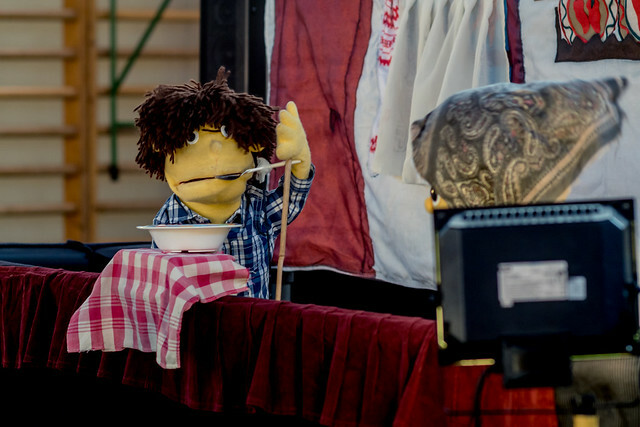 Erdotarcsa happened to be our final show for this year as our show scheduled for Thursday was canceled due to students being sick. 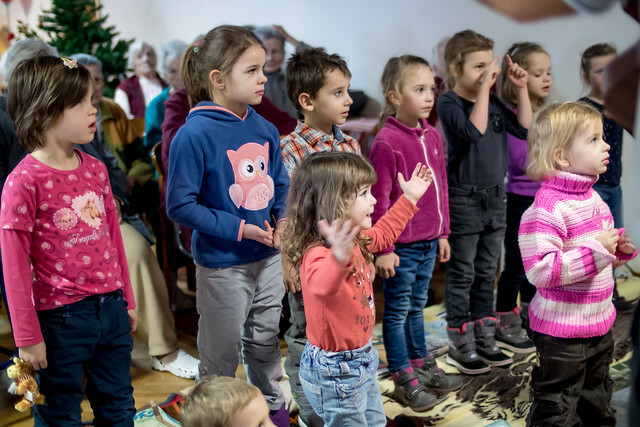 Thank you all for your prayers and support for this ministry. 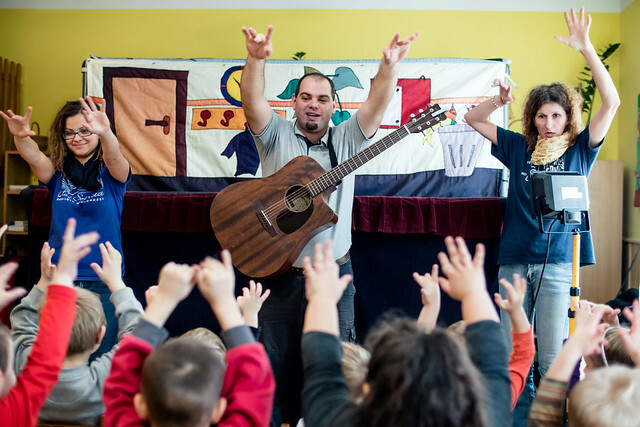 God was gracious to constantly provide for us and protect us as we traveled to over 30 schools. 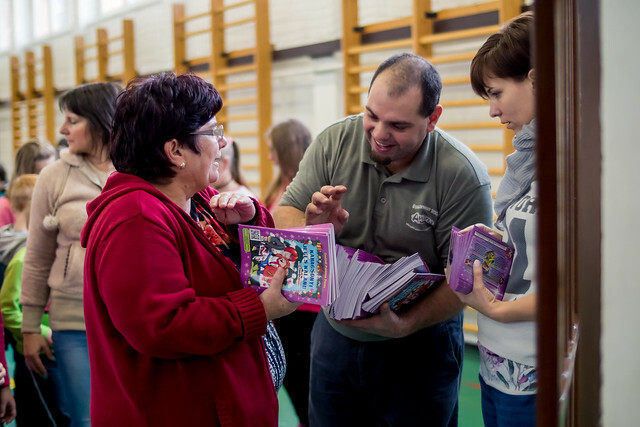 Praise God for seeds of His Good News distributed to over 2,000 children. 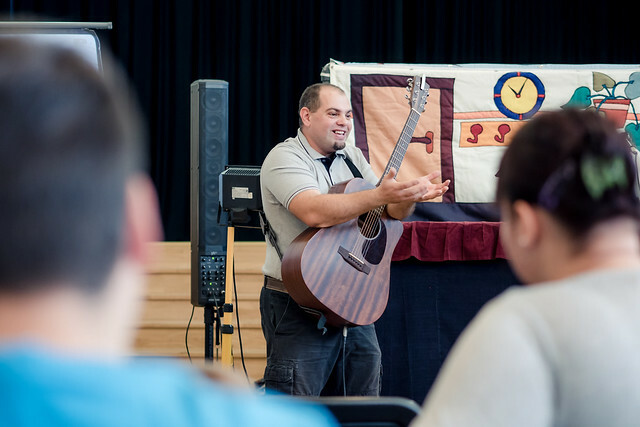 Please pray for all those who were involved in this ministry to have restorative rest as they spend time with family. 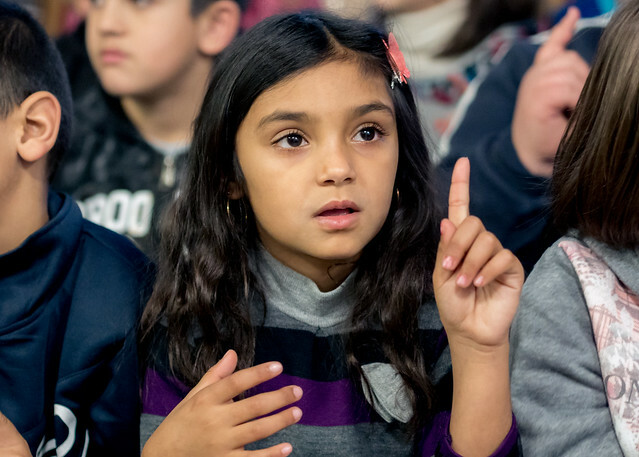 Some are still dealing with sickness (as well as some of our kids), and we ask you to pray for complete healing. 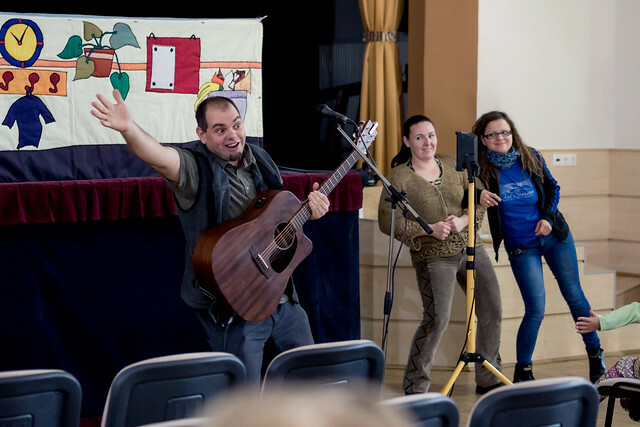 Jászfényszaru is one of the towns where we are churchplanting. 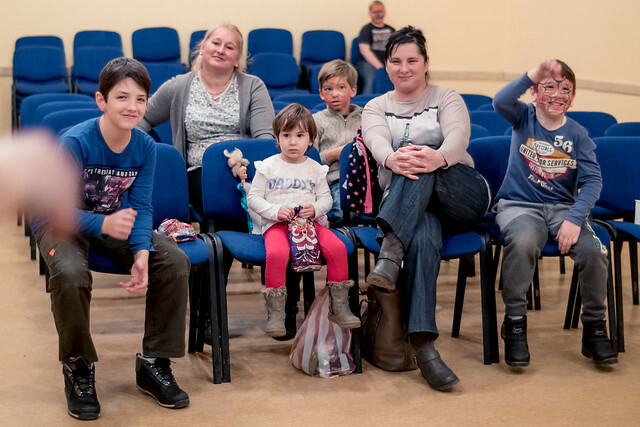 God has been gracious to form a small core team of believers that meet weekly for either a small group Bible study or worship service in the local community center. 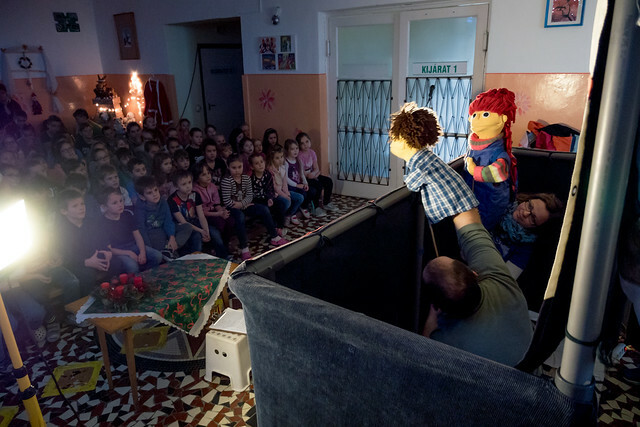 On Wednesday, we practically had all the preschool age kids from the town gather together in the community center for our Christmas Puppet show. 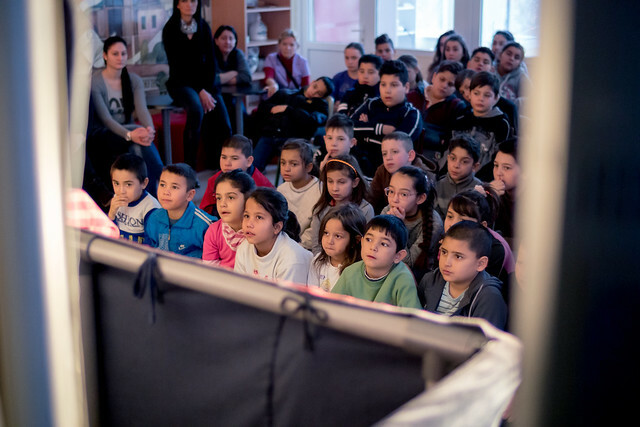 What an amazing open door to proclaim the gospel to these children that are precious in God’s sight. 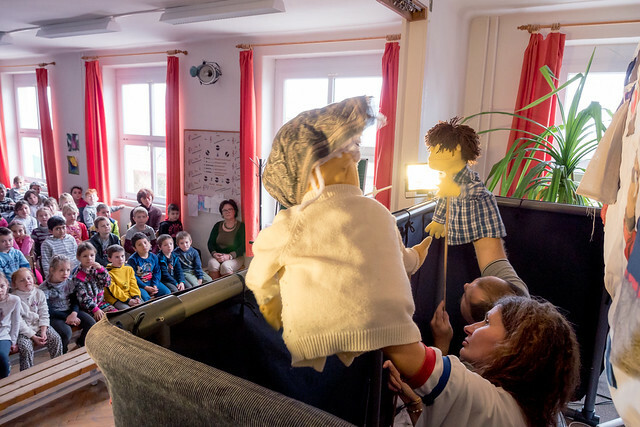 Around four years ago, we were informed that we were no longer able to present our Puppet Show in Lorinci and Selyps public school. 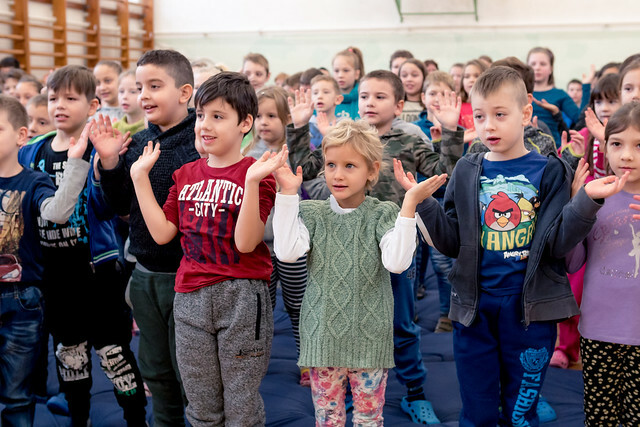 This was bad news, as these two schools are in the towns that neighbor our hometown of Petofibanya and we even have kids of church members who attend these schools. 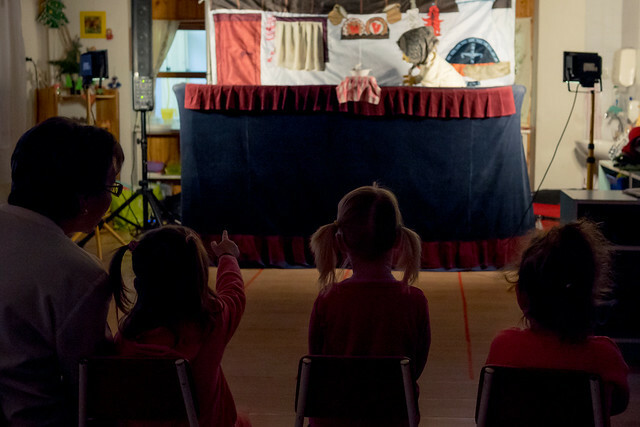 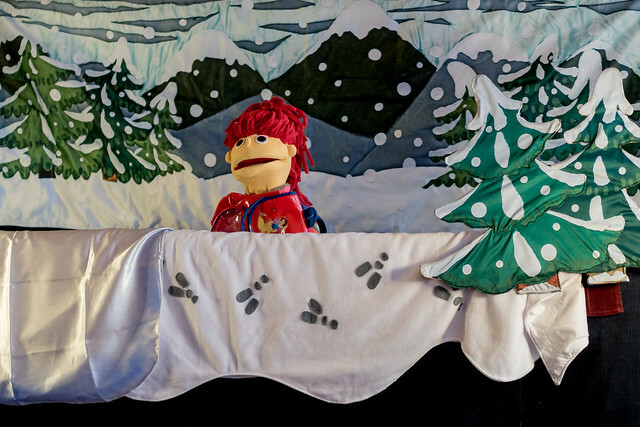 But just this year there was a change with a new principal and we have been granted permission to return with our Christmas Puppet Show! 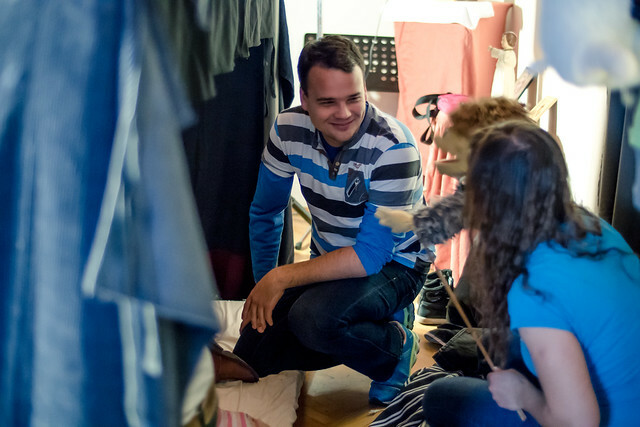 Praise God for opening this door once again! 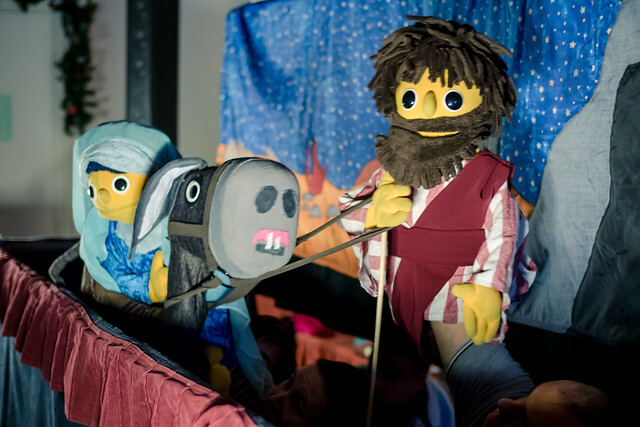 The team will be off on Saturday and Sunday and will be back out traveling on Monday as we finish this year’s Christmas Puppet outreach. 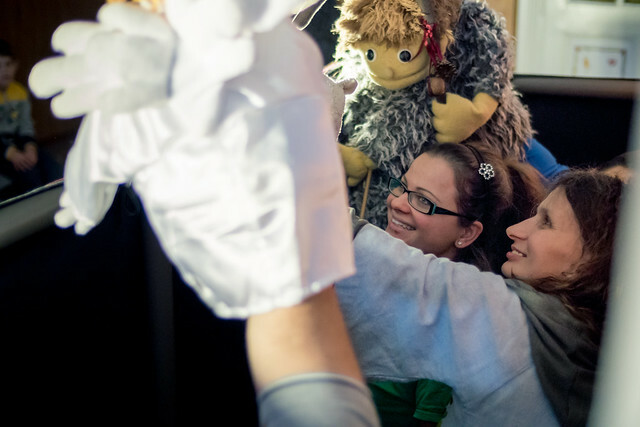 Please pray for team members who are struggling with sickness or have kids that are sick. 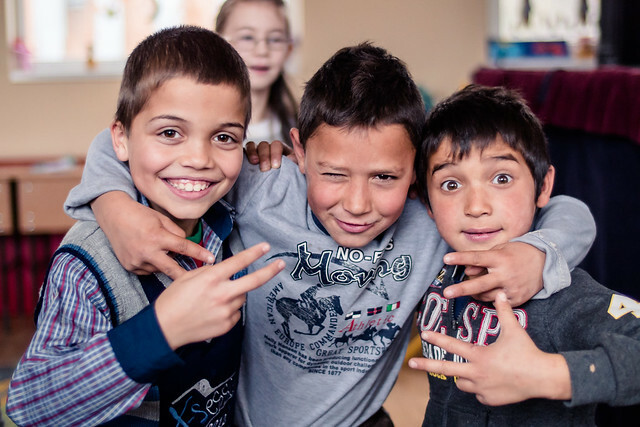 Pray for bodies to be restored, for good rest and protection from the enemy. 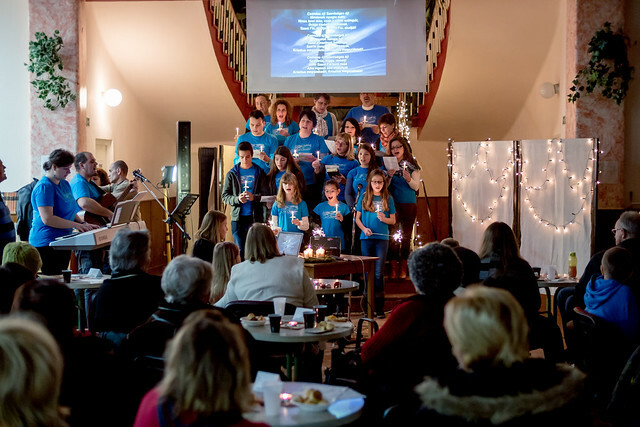 Please also pray for our Christmas Worship Service this Sunday where we expect visitors that normally do not attend having an opportunity to hear the Gospel. 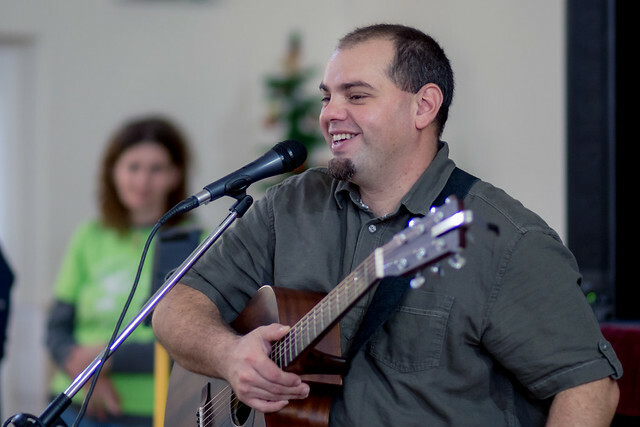 Thanks for your continued prayers! 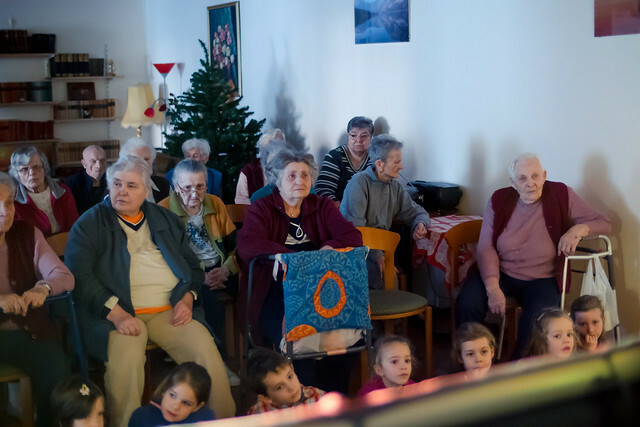 Above: Member from our church have been practicing over the past few weeks for our Christmas presentation for our last Sunday service in December. 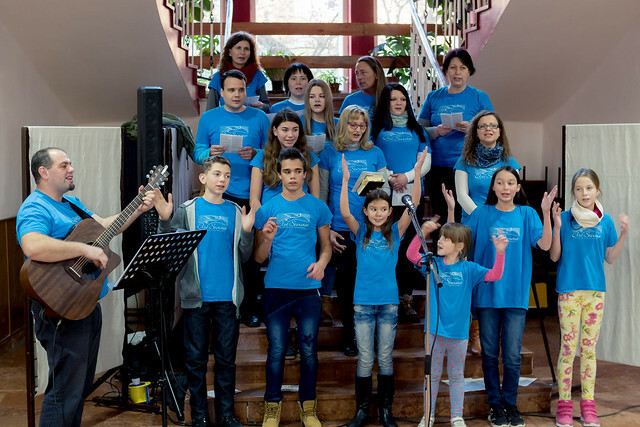 On Monday night we were privileged to be able to perform for a local group of elderly folks from our town along with some school kids that gathered together for various activities in the local community center. 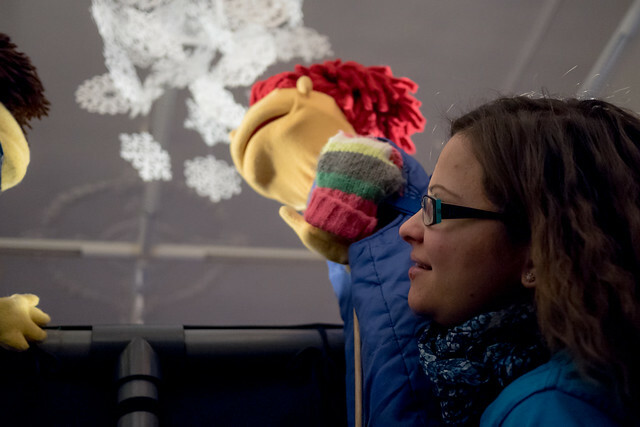 Above: Edit reading segments of the Christmas account. 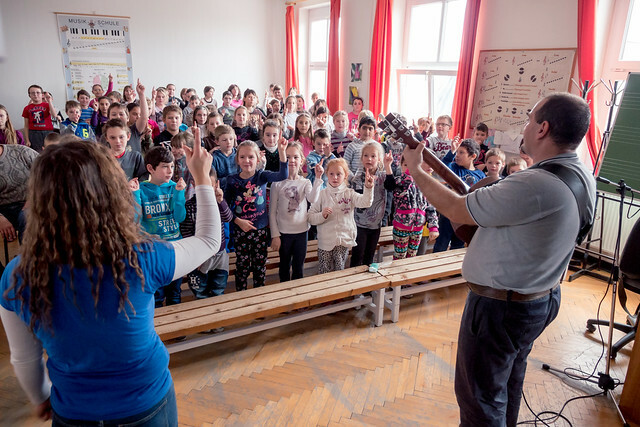 Above: Praise God for great weather thus far in Hungary. 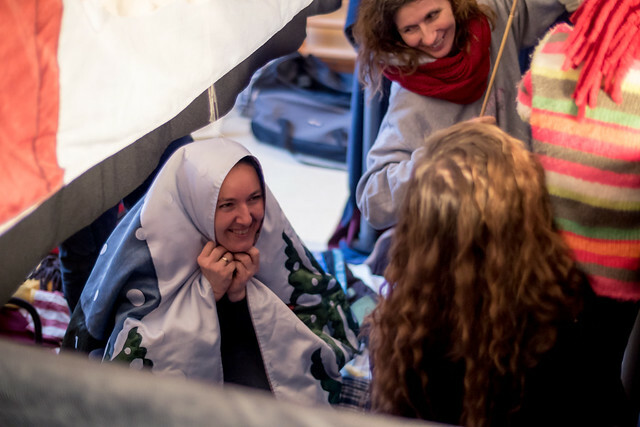 It is a blessing to not have to deal with slippery roads and snowfall when we are constantly unpacking and packing for each show. 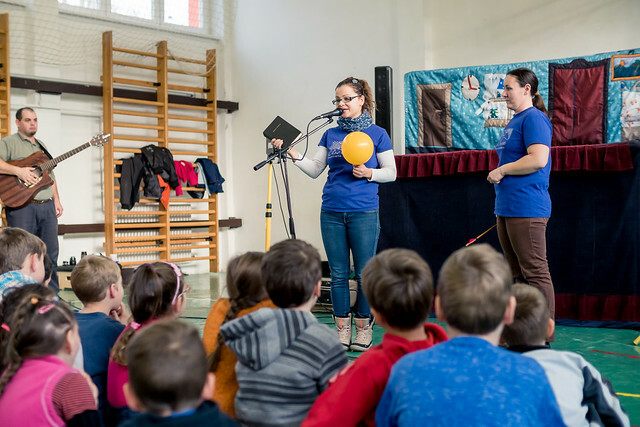 Above: Zita using a balloon and a small pin to illustrate the destructive force of the smallest lie. 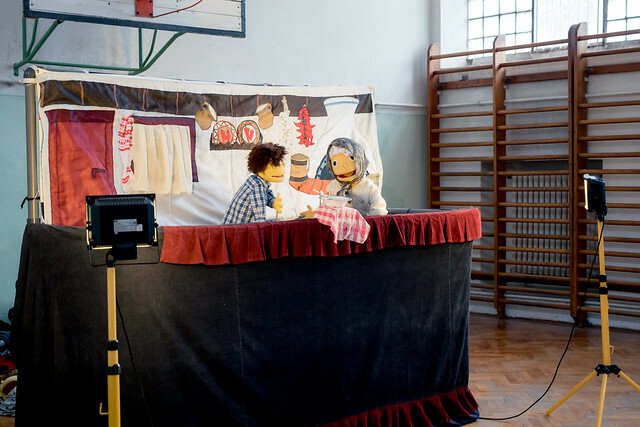 In the puppet show, one of the characters gets into a life threatening situation because of lying and not listening to her grandmother. 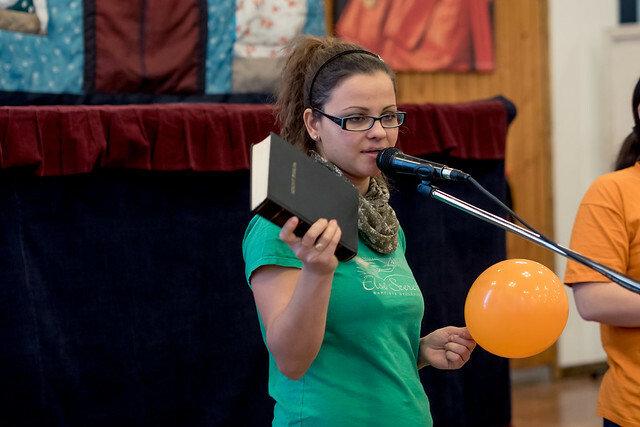 Above: Zita explaining how Jesus came to save us from sin and empower us to live right as we remain in fellowship with Him. 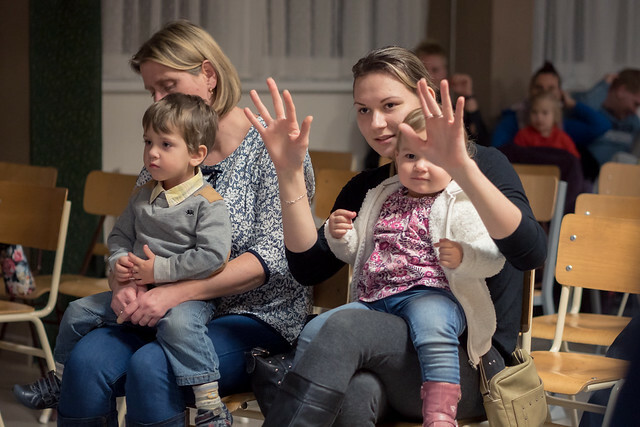 Praise God for continued strength and help as we take the good news of the Gospel to a new generation! 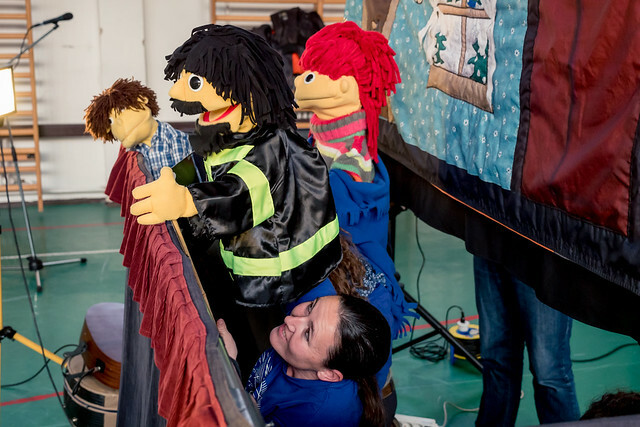 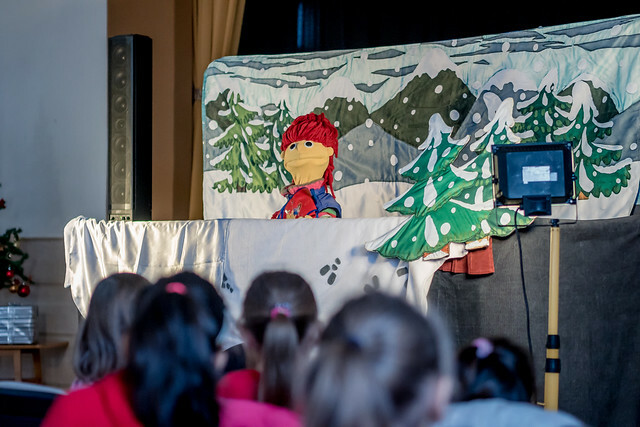 The puppeteers are doing a great job and this year’s show has been great at keeping all the kids attention and involvement throughout the show. 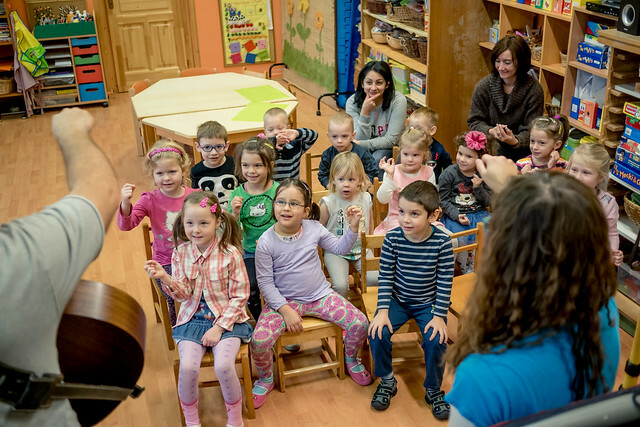 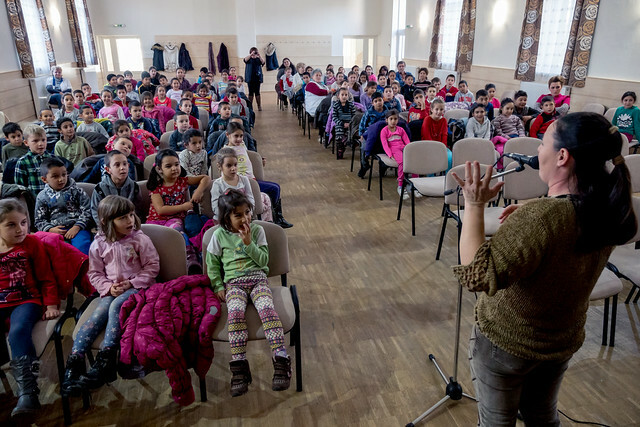 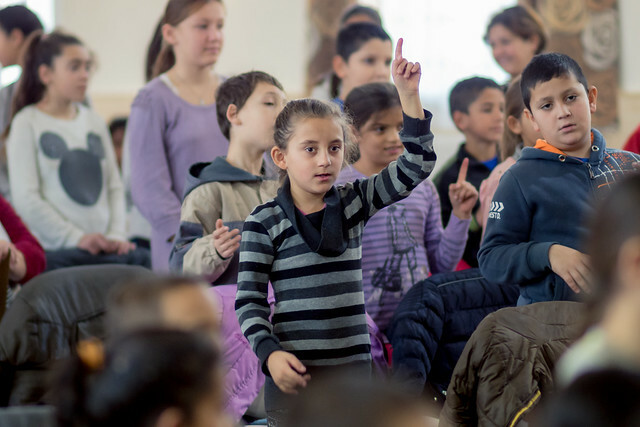 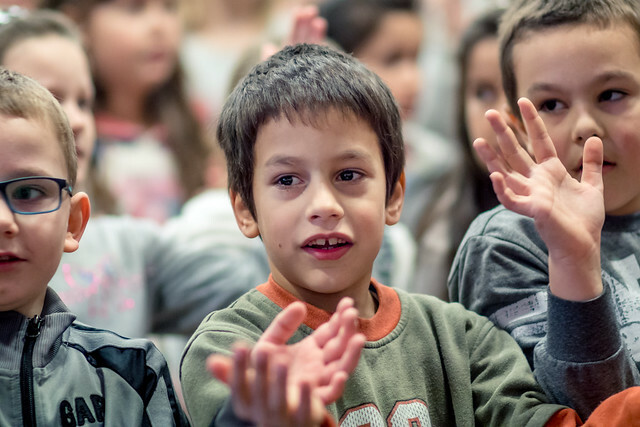 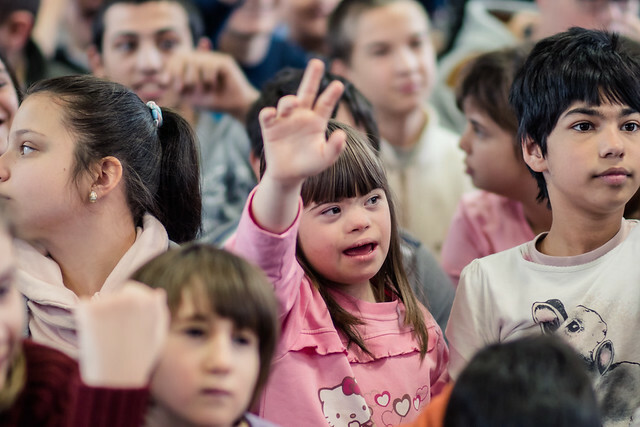 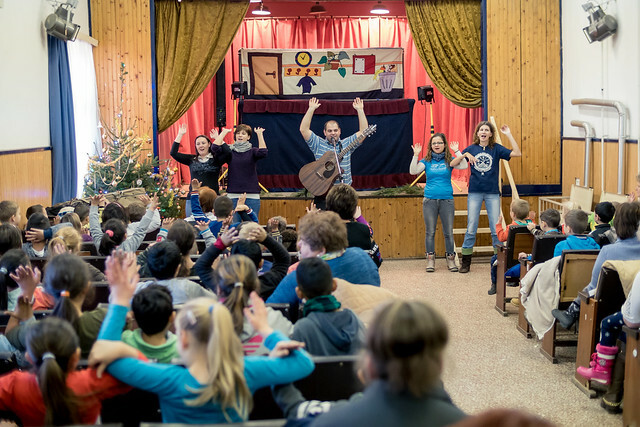 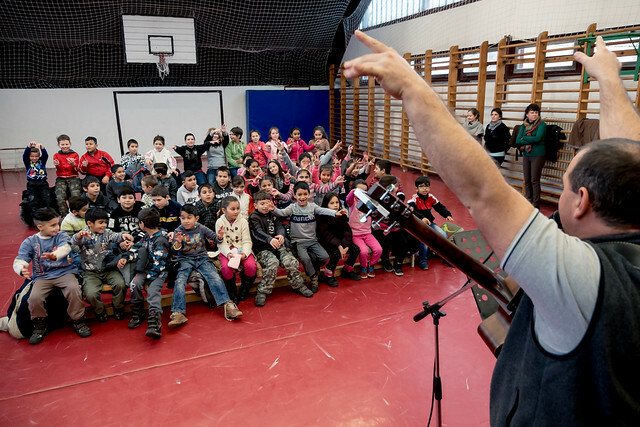 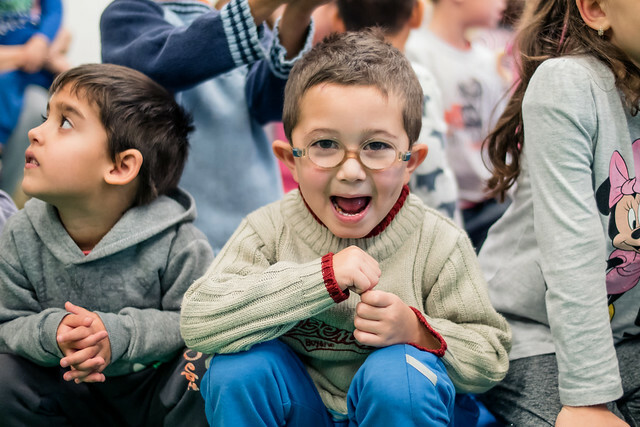 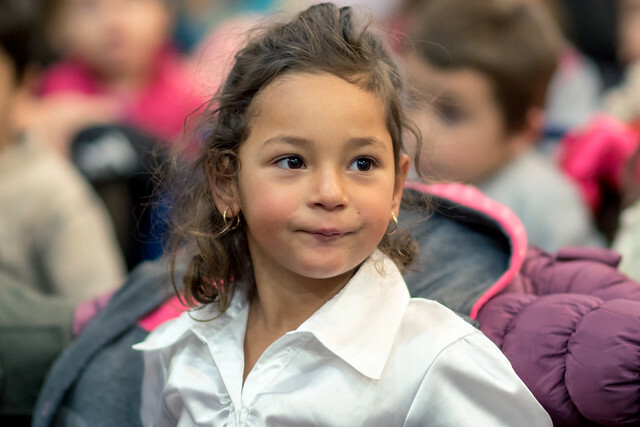 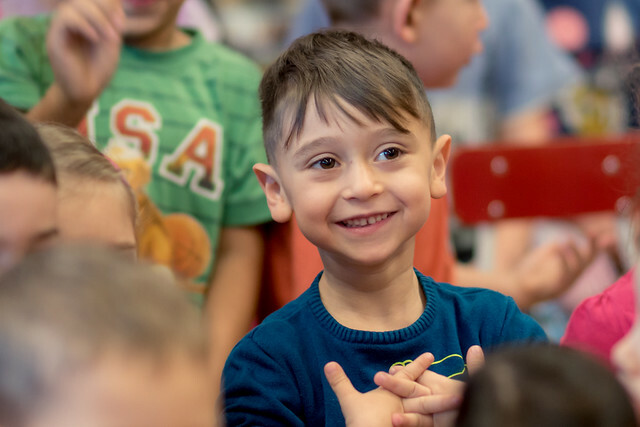 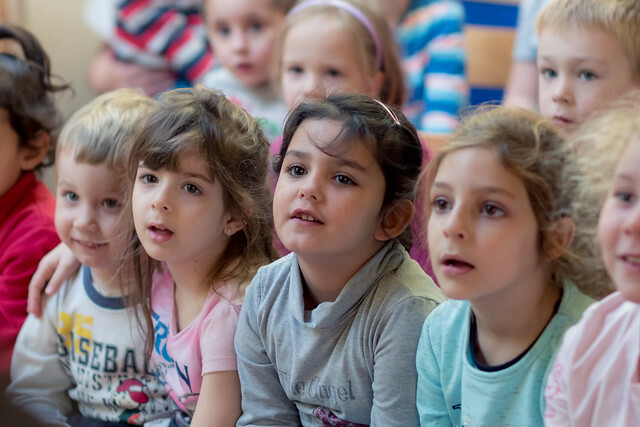 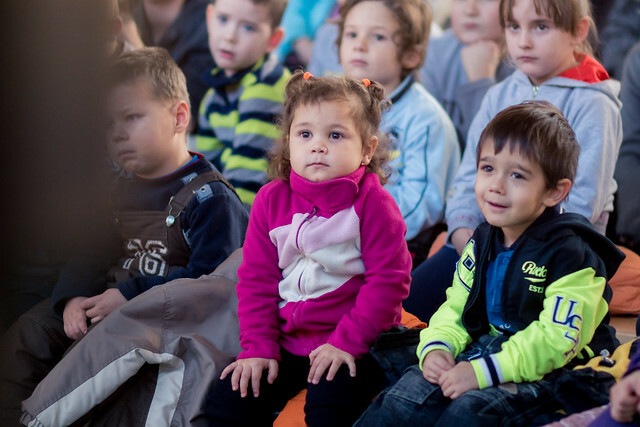 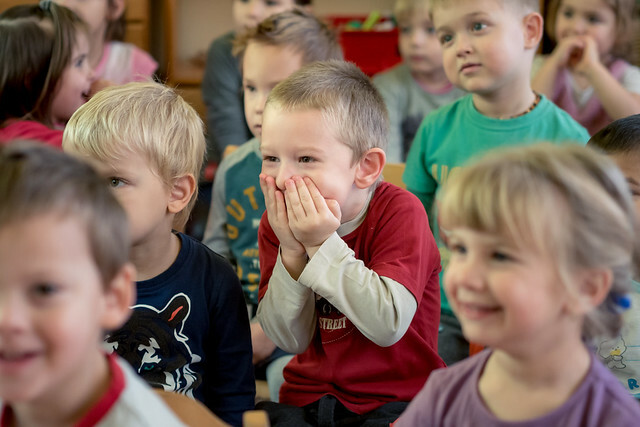 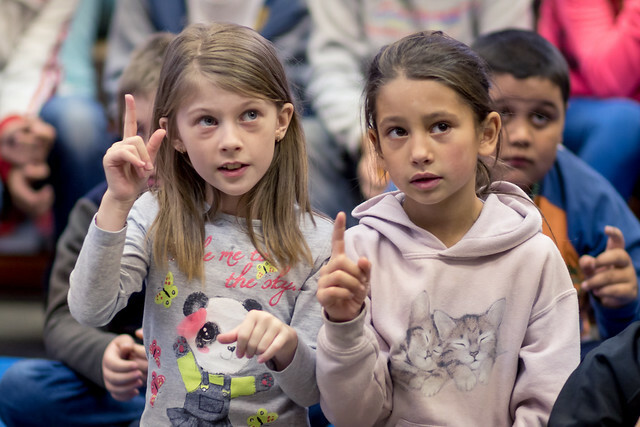 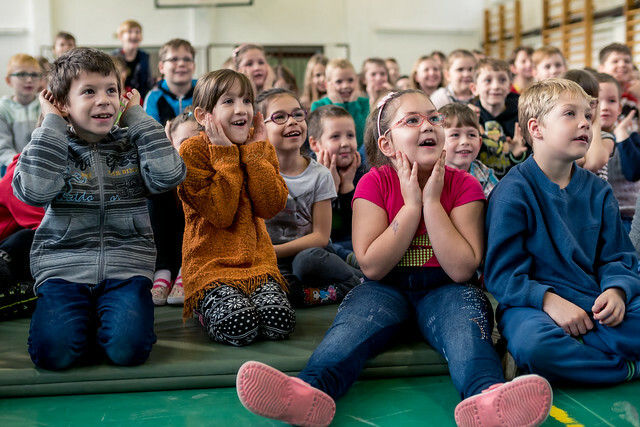 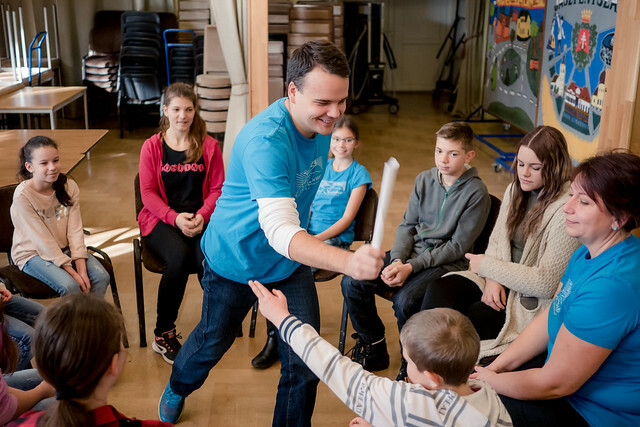 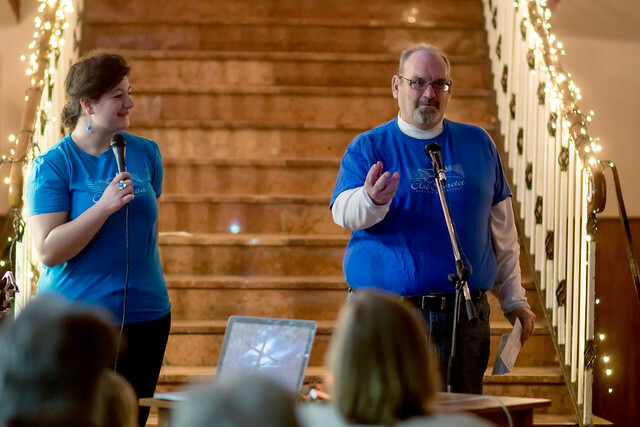 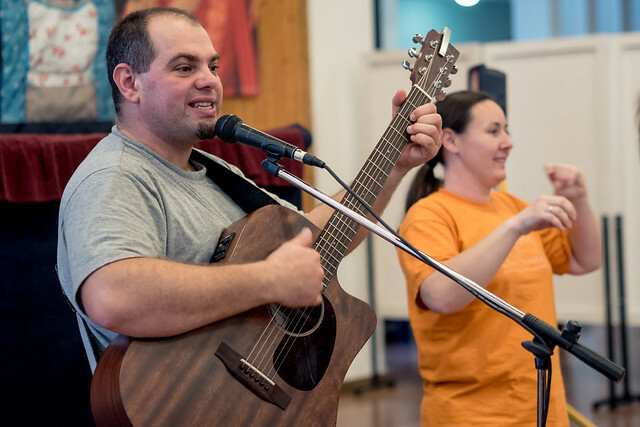 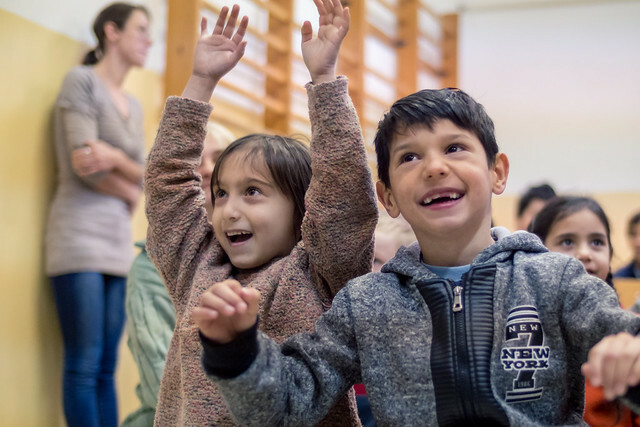 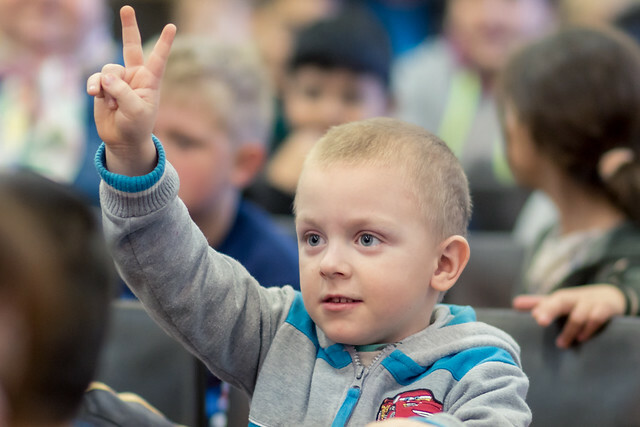 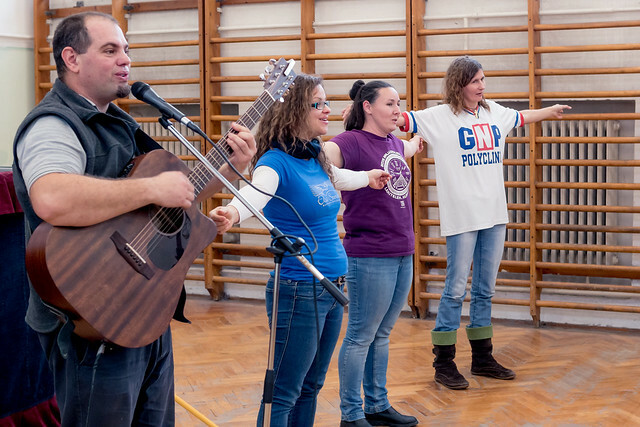 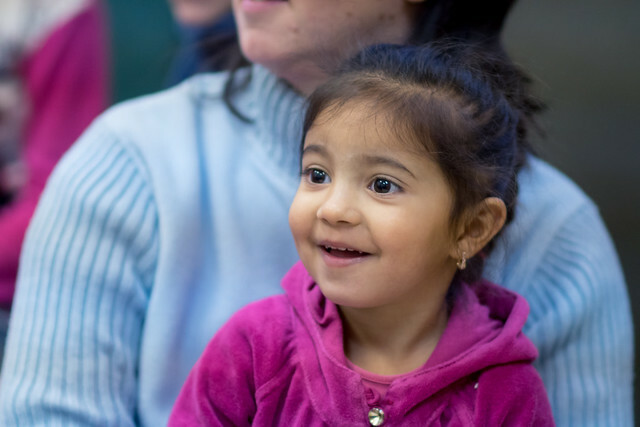 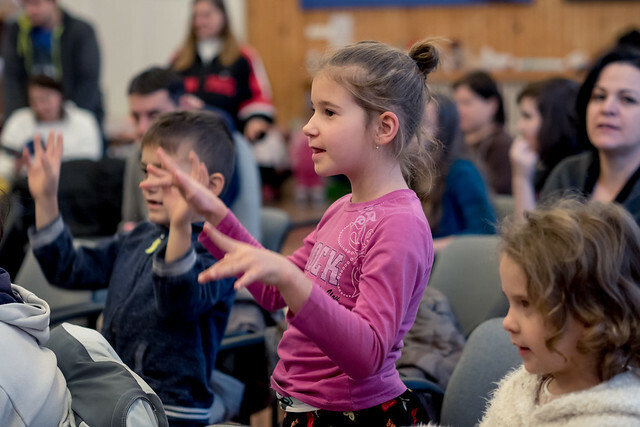 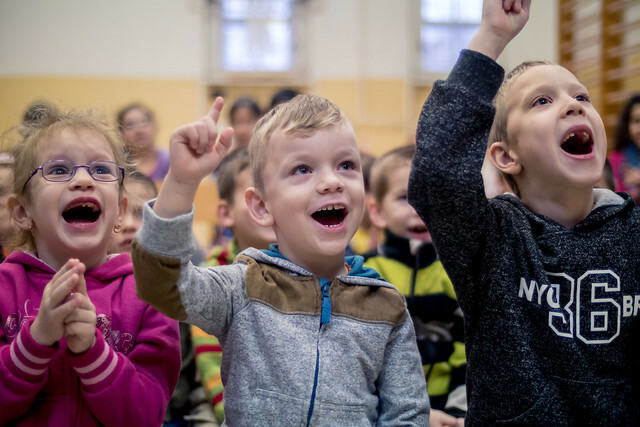 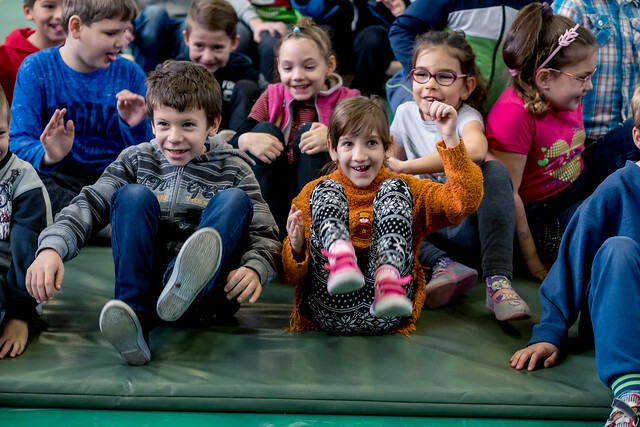 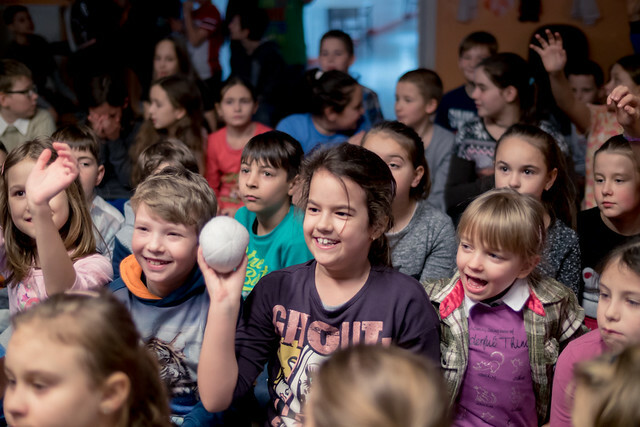 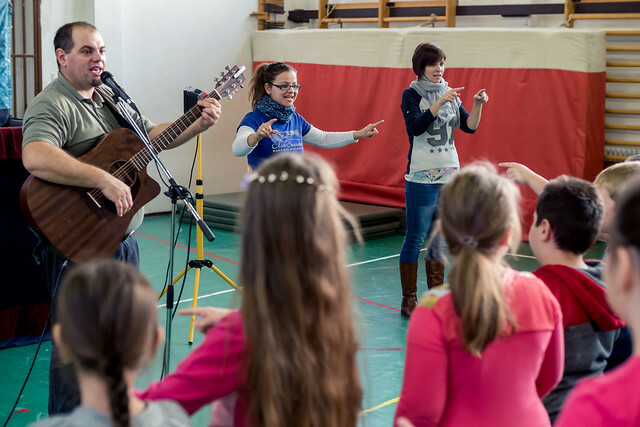 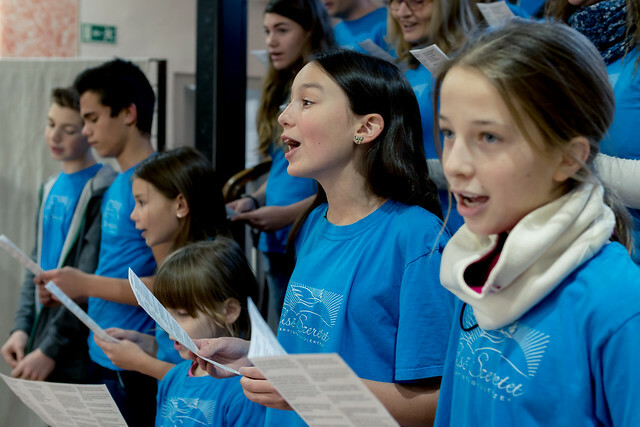 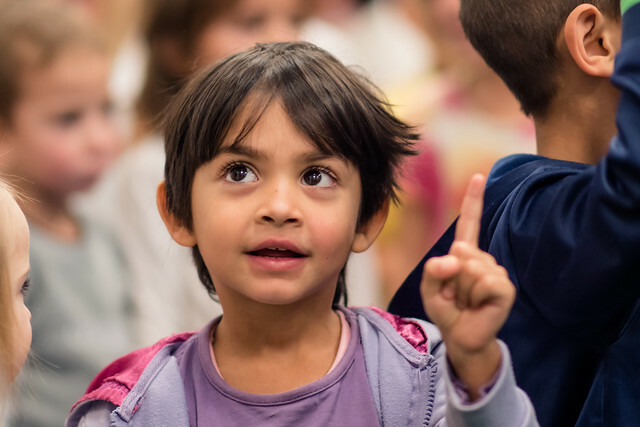 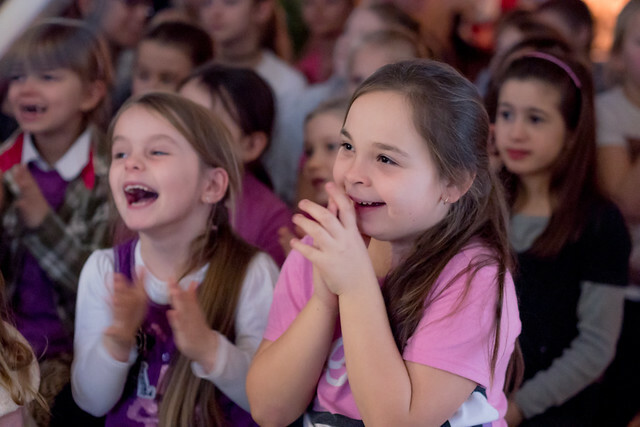 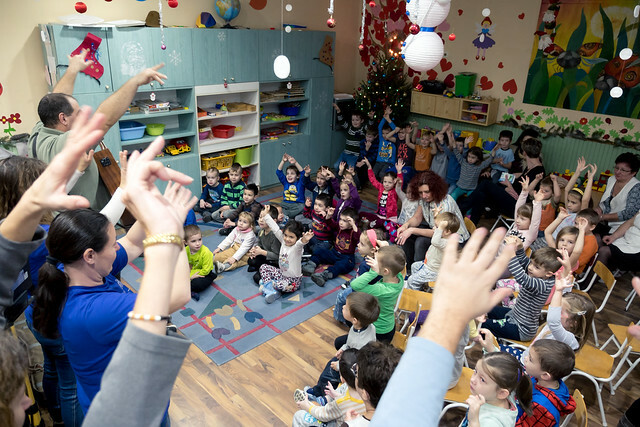 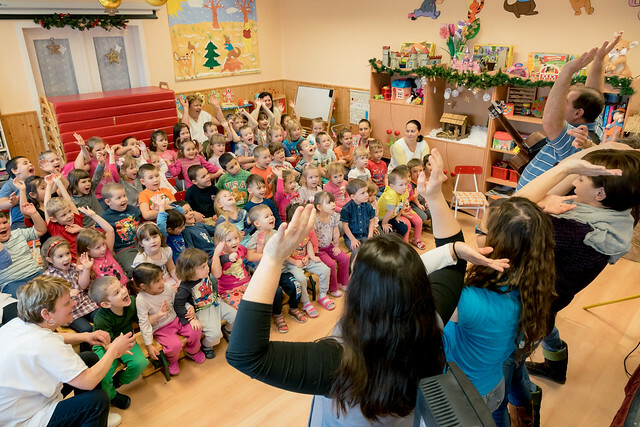 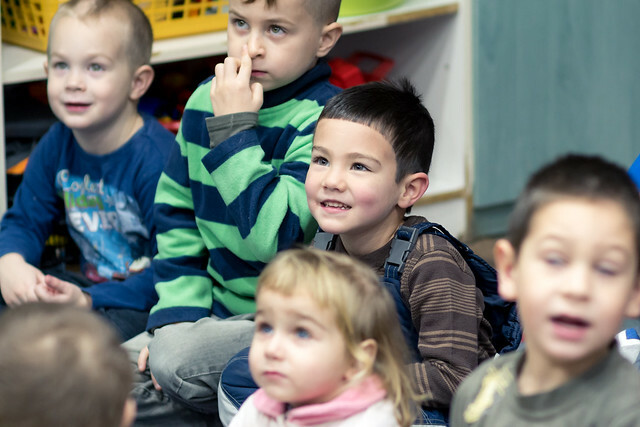 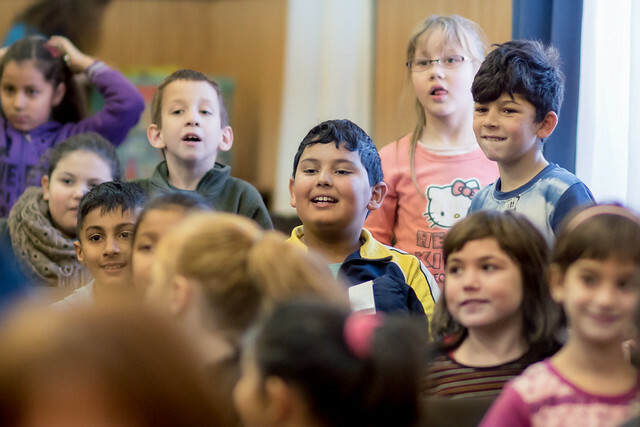 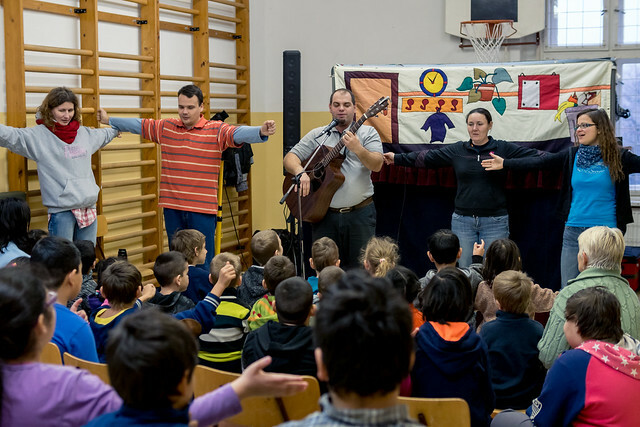 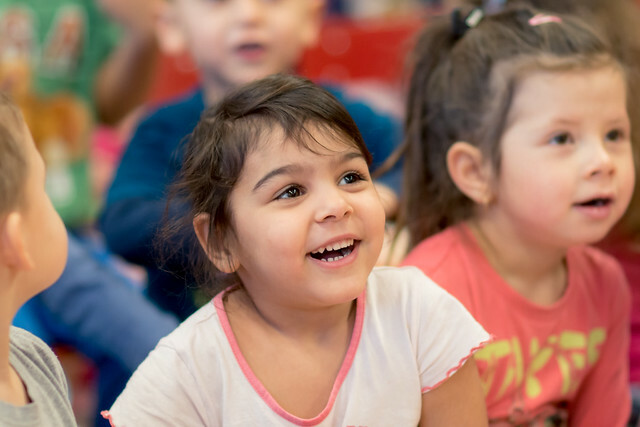 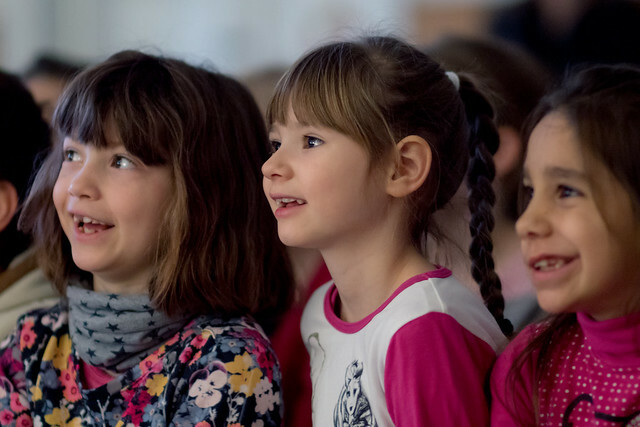 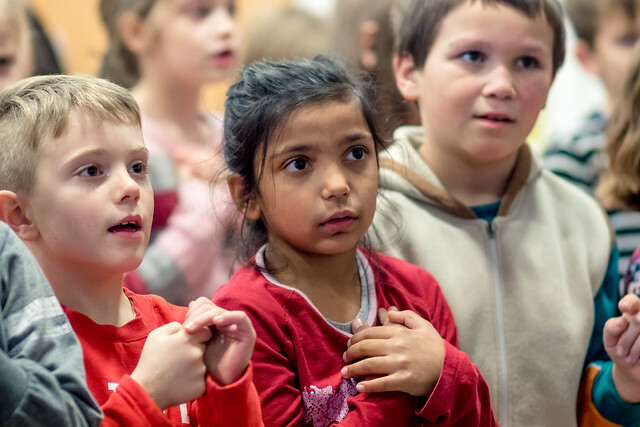 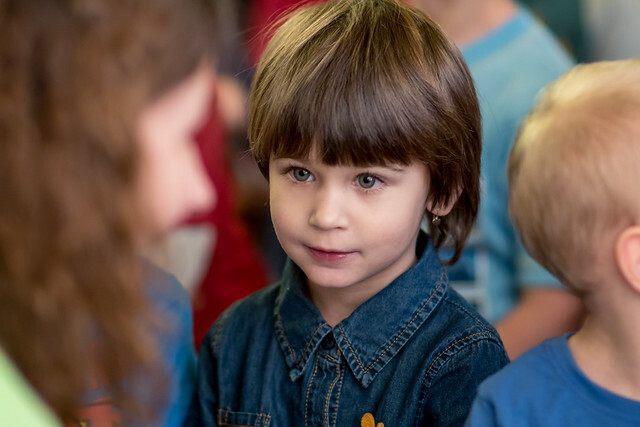 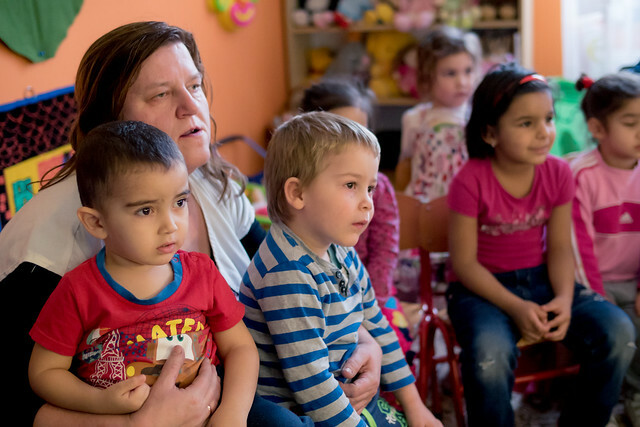 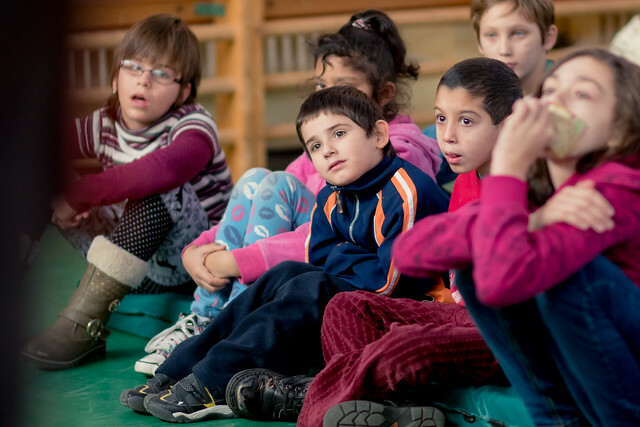 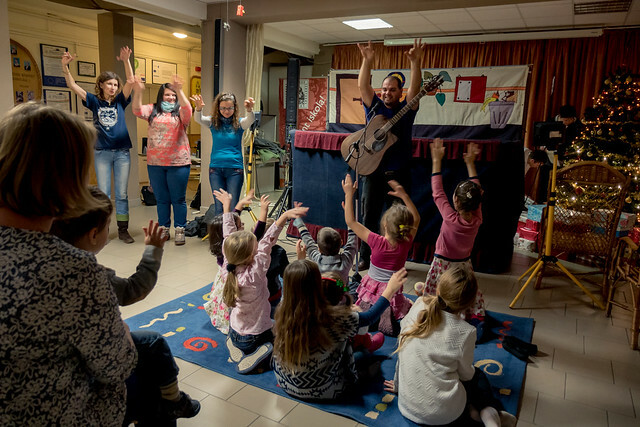 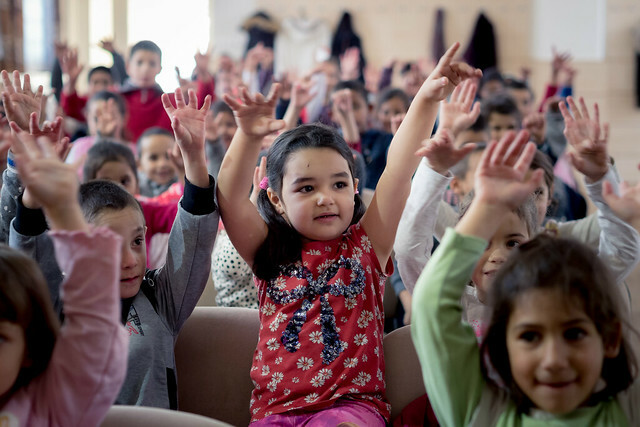 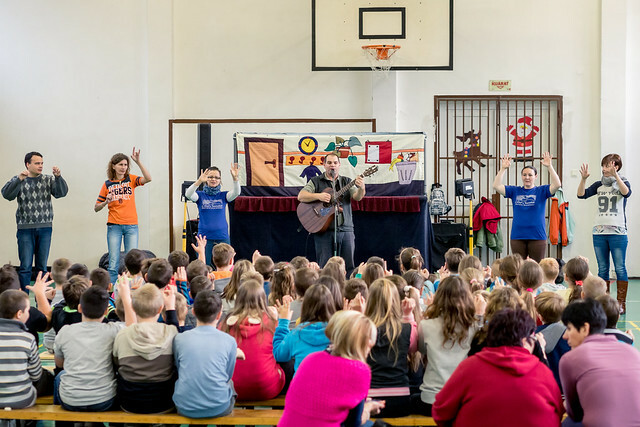 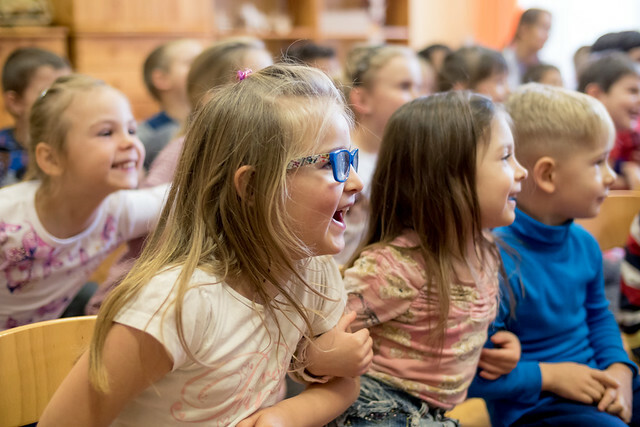 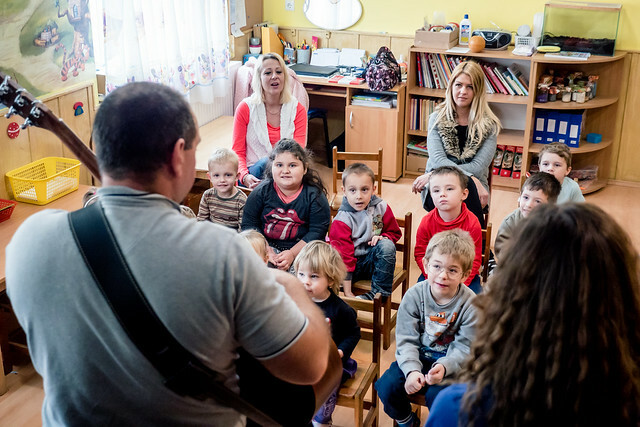 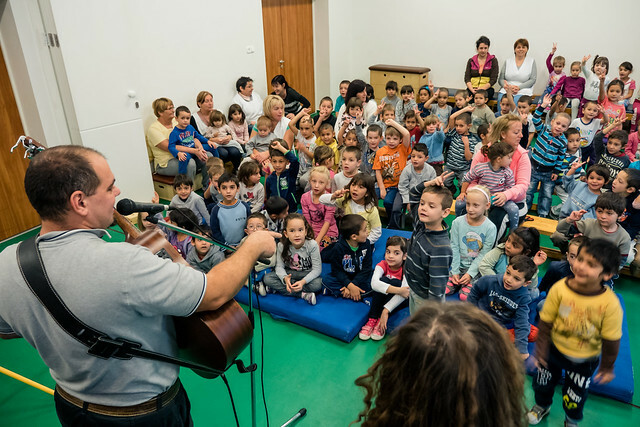 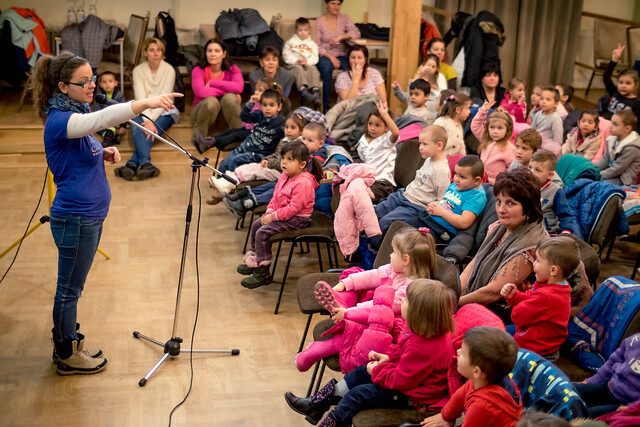 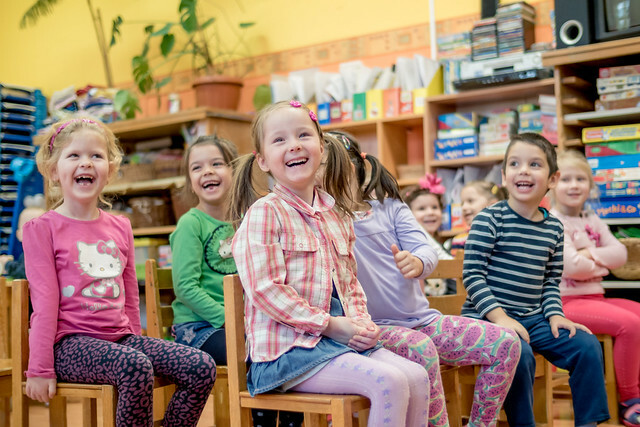 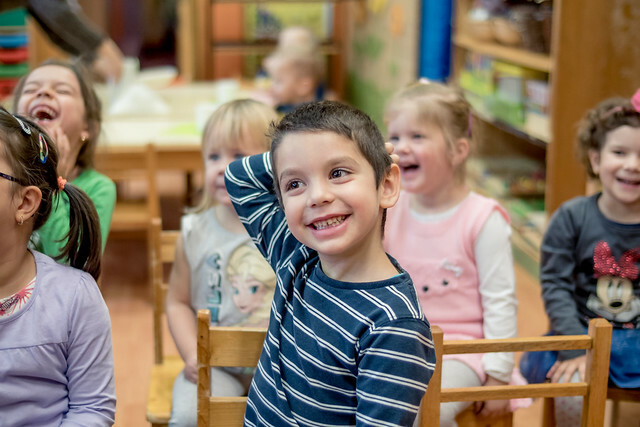 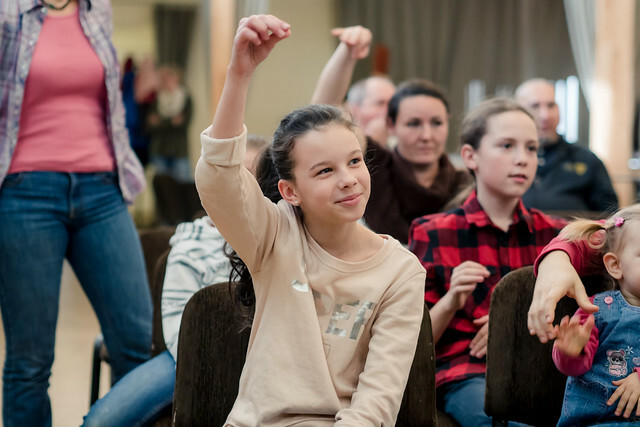 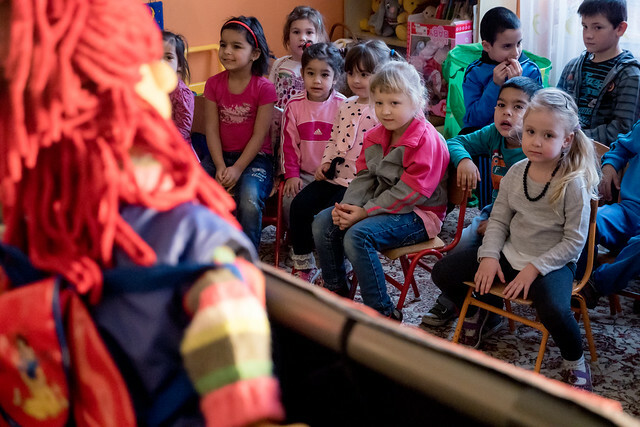 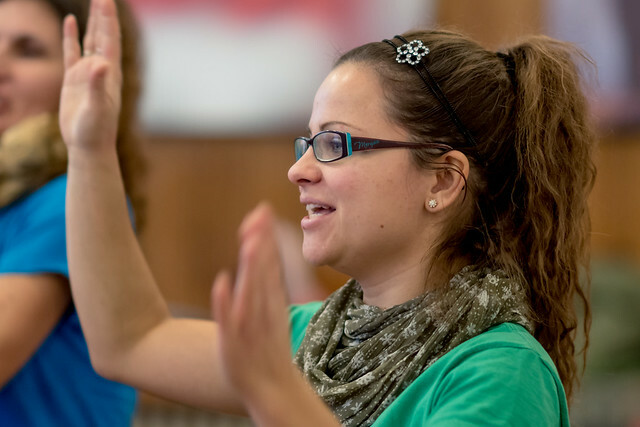 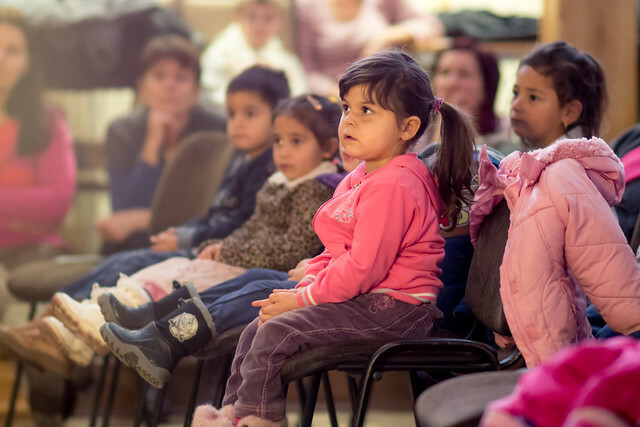 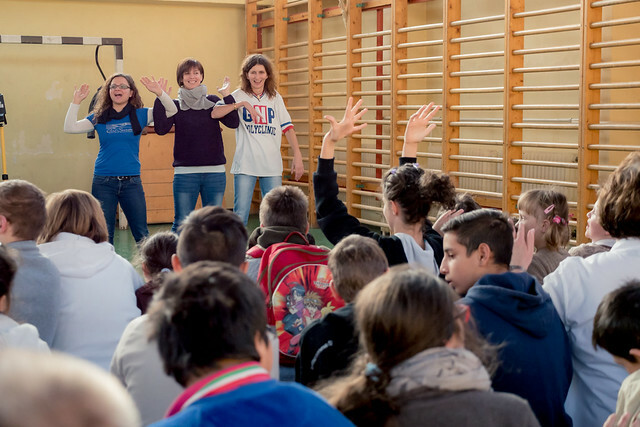 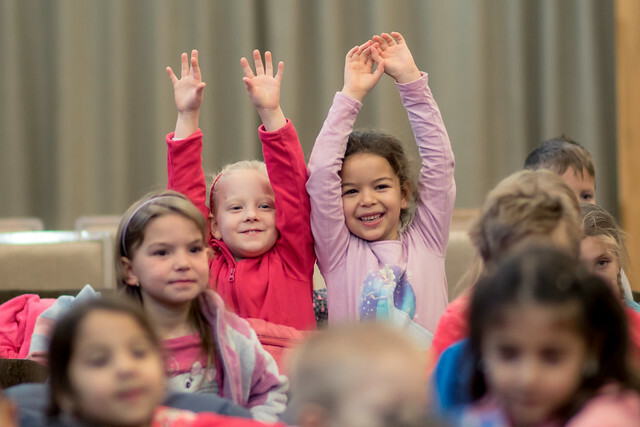 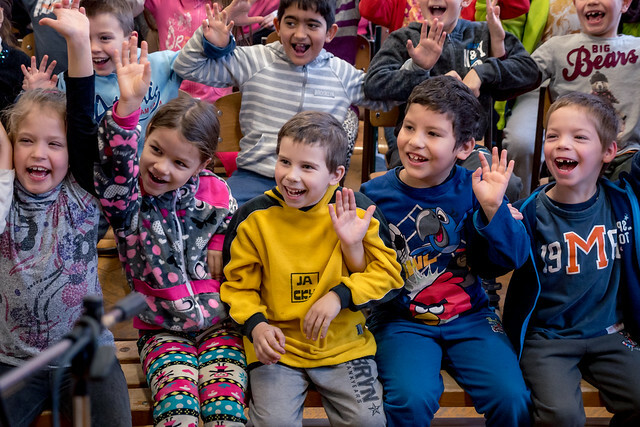 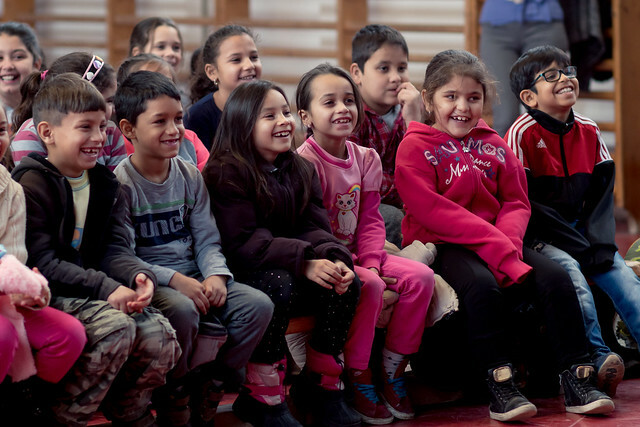 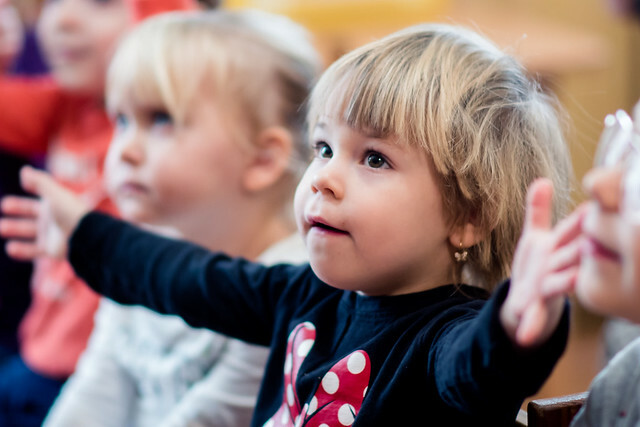 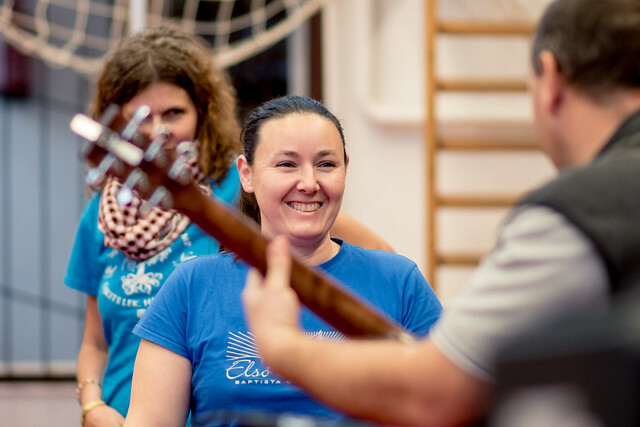 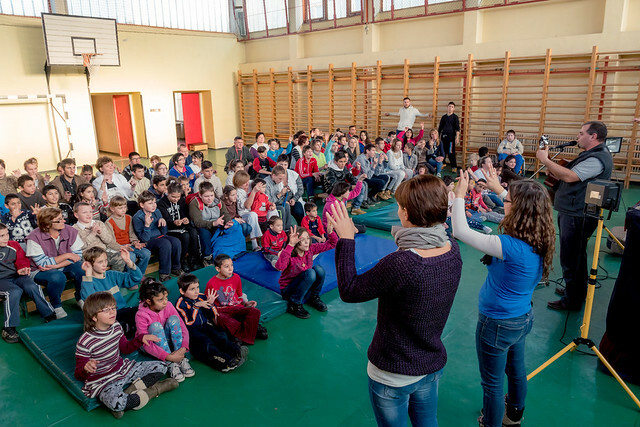 Praise God for the open door in Hungary to teach and sing about Jesus in the public schools. 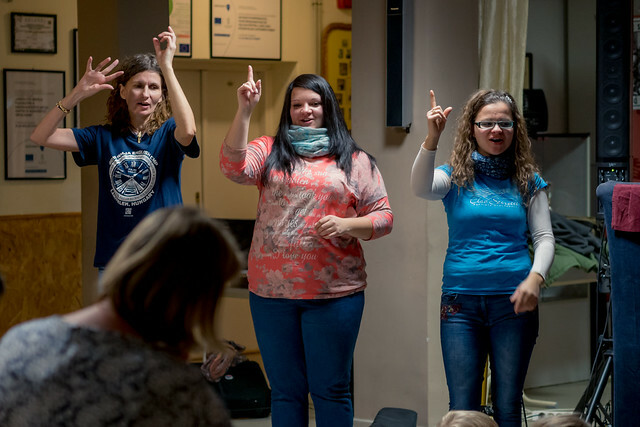 Please pray for team members Jennifer, Miki, Eszti who are struggling with sickness. 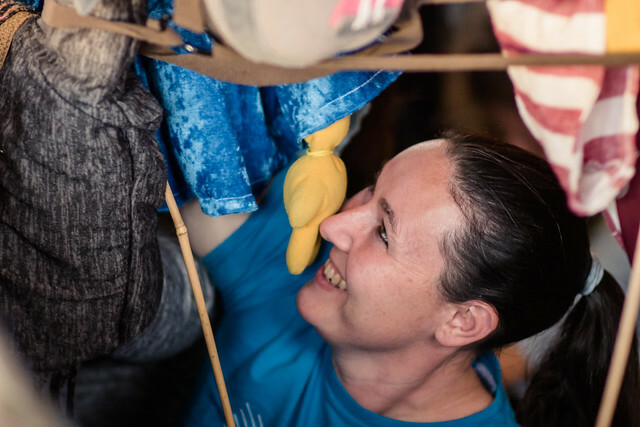 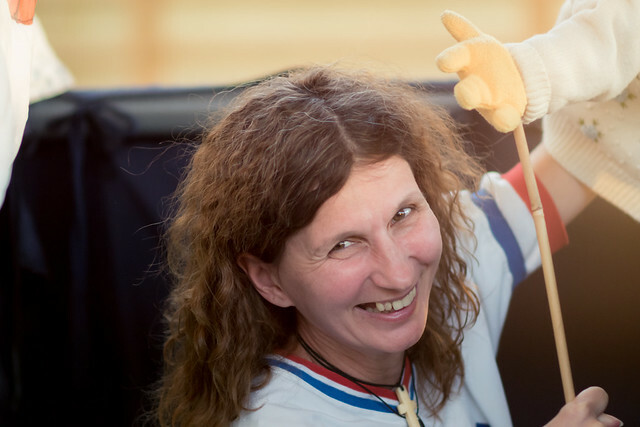 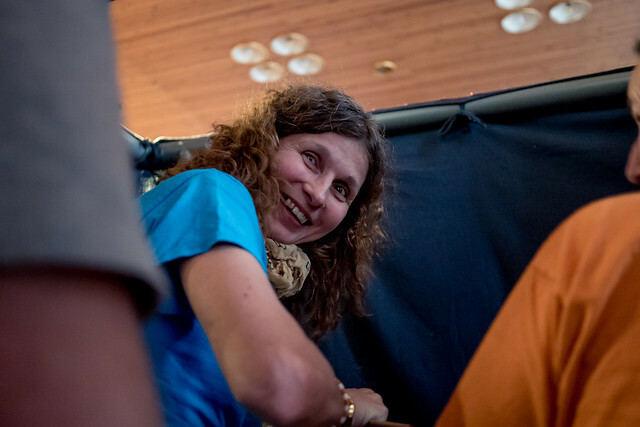 Pray for team member Zita who has not been sleeping well since we began the puppet ministry. 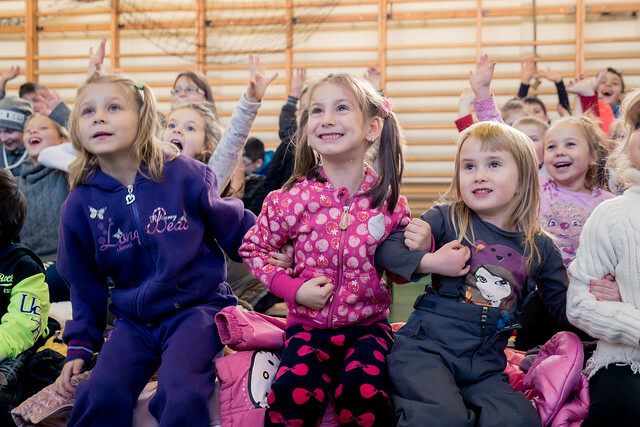 Pray for team members’ children who have also been suffering from sickness and nightmares/problems sleeping at this time. 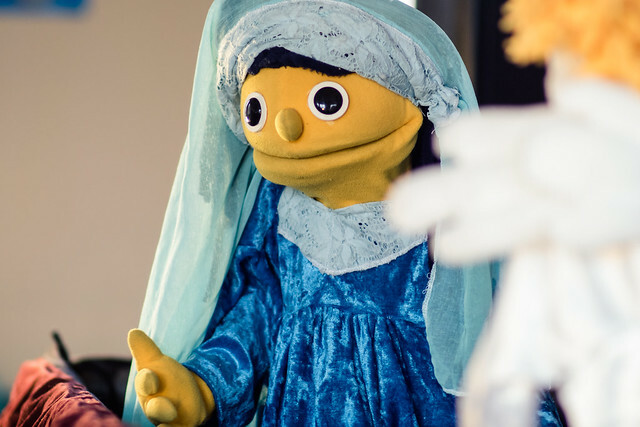 Pray for continued strength and protection as we are out again tomorrow performing three shows. 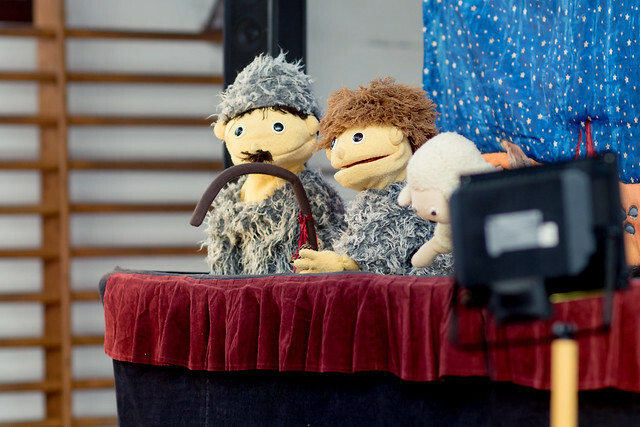 Above: Miki and Hugi always bringing laughter to the team. 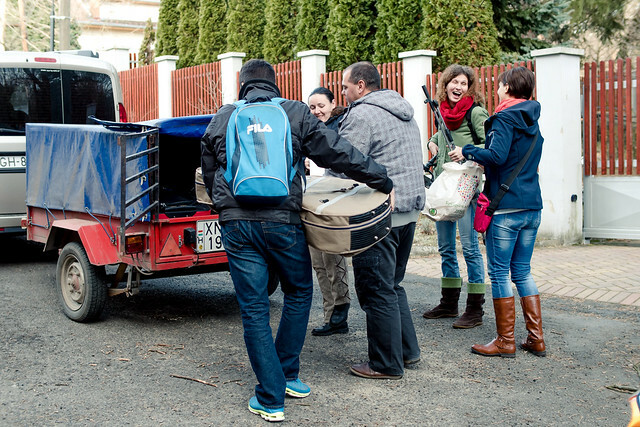 We were greeted with much expectation and excitement in the town of Kálló this past Friday. 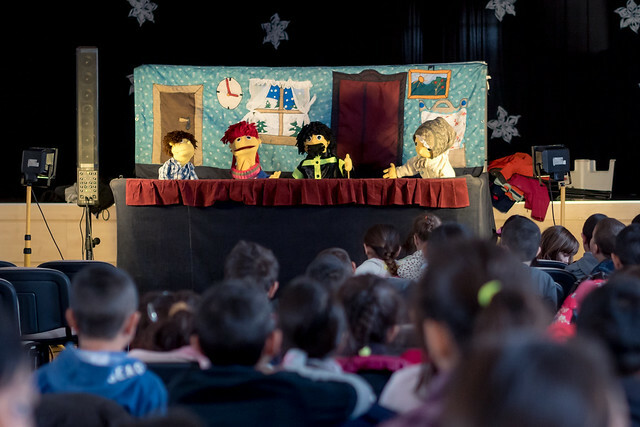 The kids were ready to sing along with us and enjoyed this year’s new puppet show. 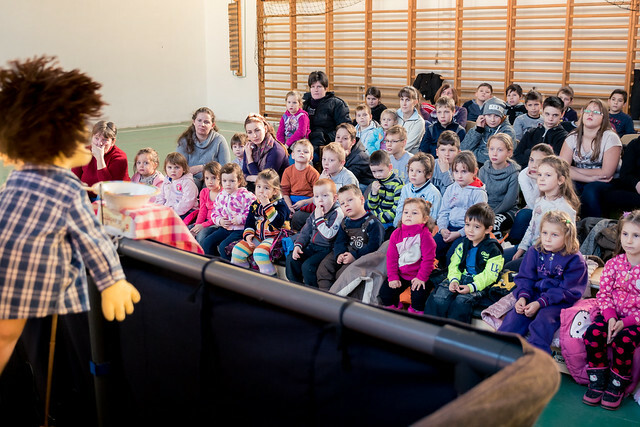 Above: There were over one hundred kids who attended and they did a great job following the story line and paying attention the entire show. 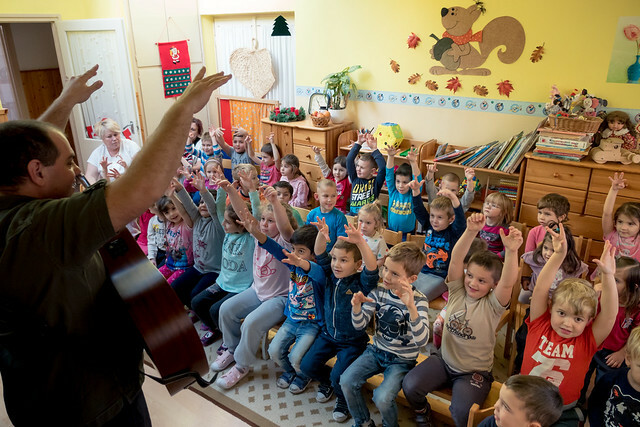 Above: Thanks again for those who helped us reach our goal for raising support for these evangelistic CD and magazines for the kids. 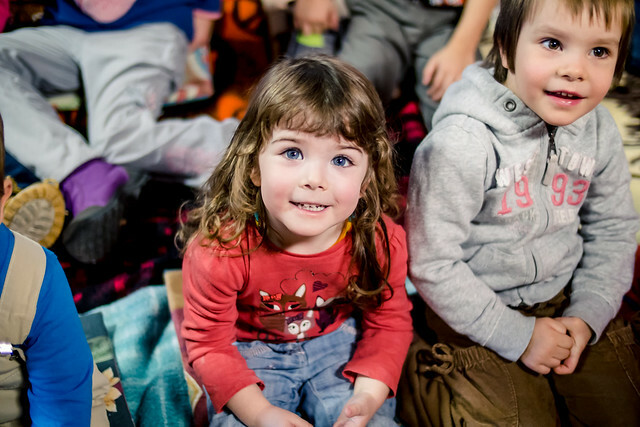 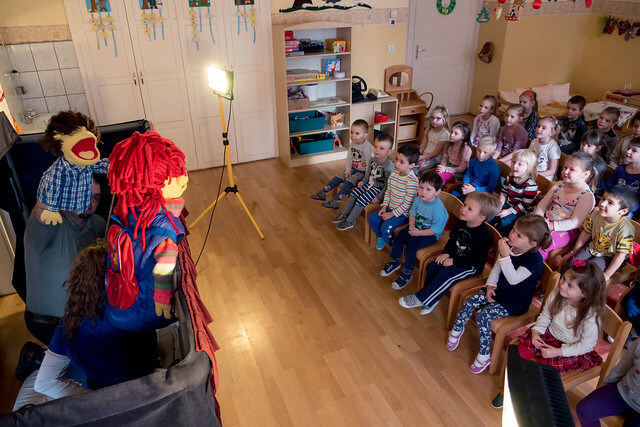 The children are always excited to receive them and they continue to listen to the puppet show at home and can read through the family magazine with their parents. 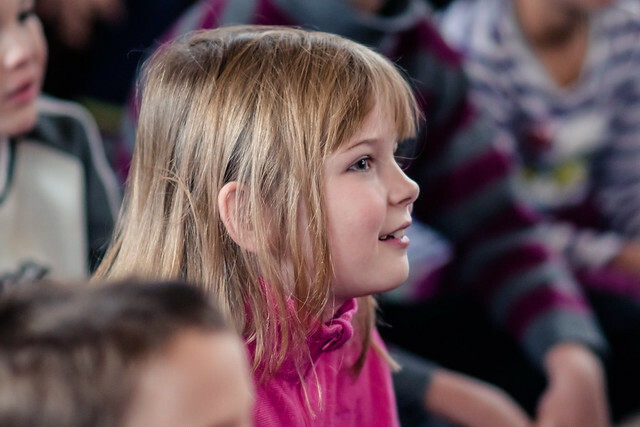 Above: Part of this year’s show includes Zsofi who ends up disobeying her grandmother. 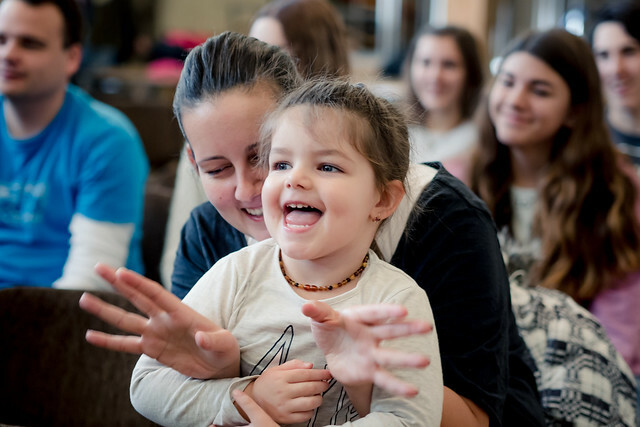 Zsofi ventures out to a local lake that she presumes is frozen over even though her grandmother already told her to wait. 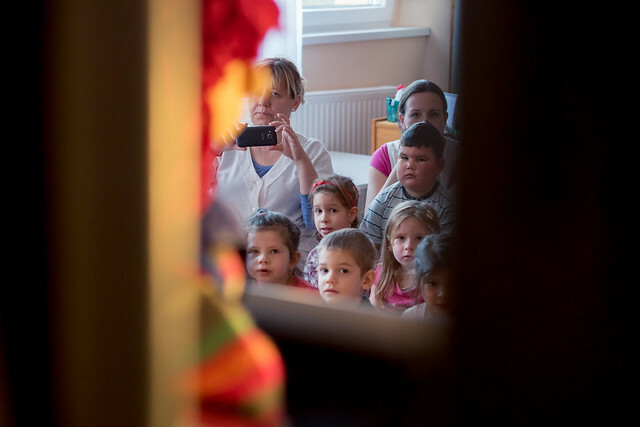 You can imagine what happens next. 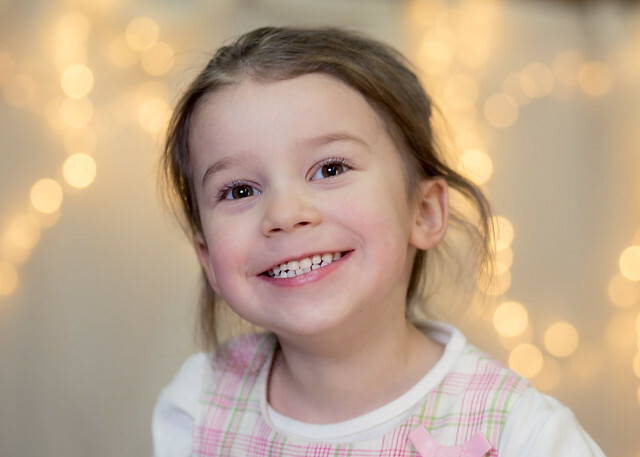 Zsofi finds herself in a life threatening situation and thankfully her little brother and dad come to her rescue. 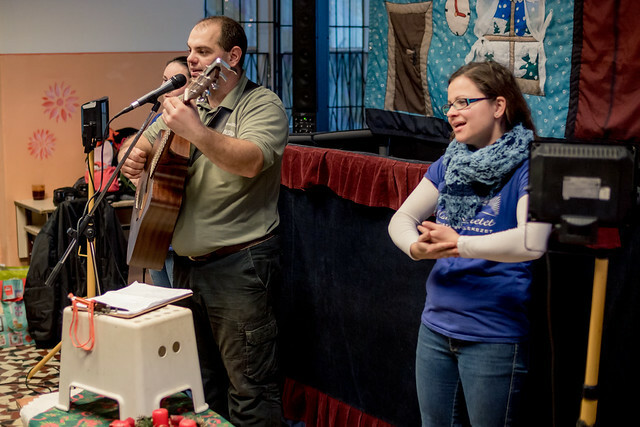 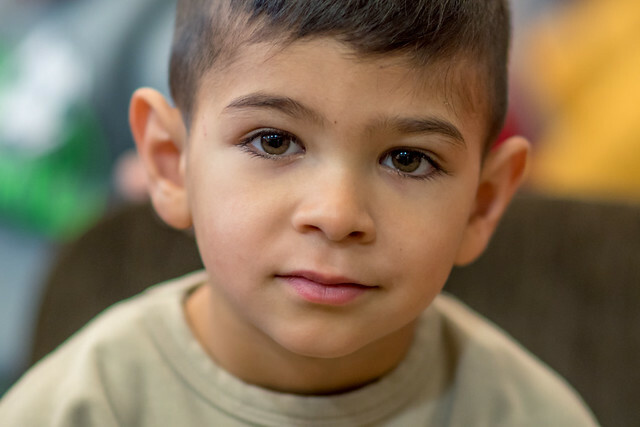 Safe at home, Zsofi’s dad talks about the problem of sin and our need for a Savior. 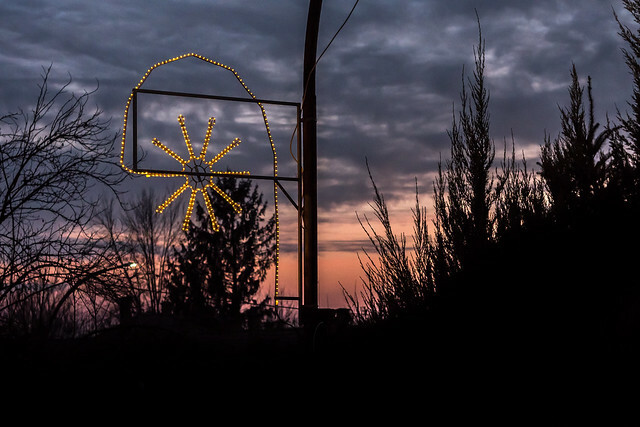 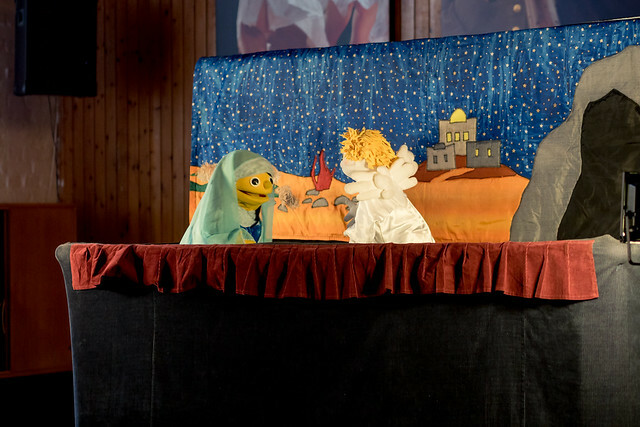 This is when the show transitions into the Christmas story of Jesus coming into the world. 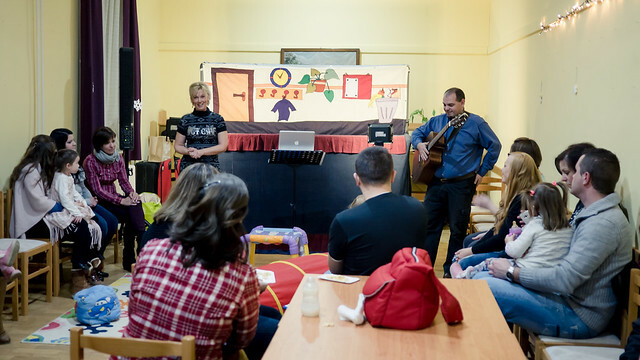 Above: Hungarian partners in ministry Erika and Miki speaking to parents who came out to a special MOPS club Christmas meeting on Friday night. 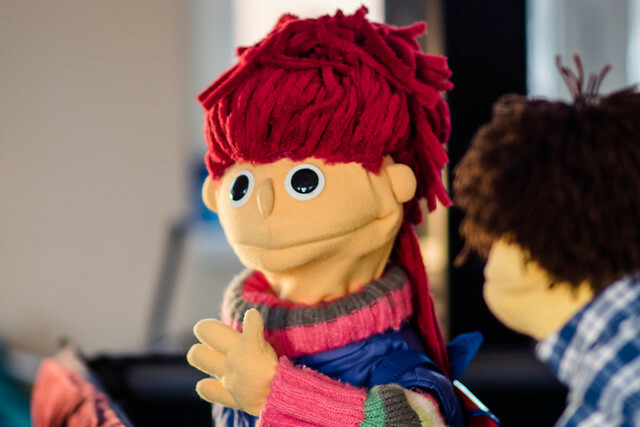 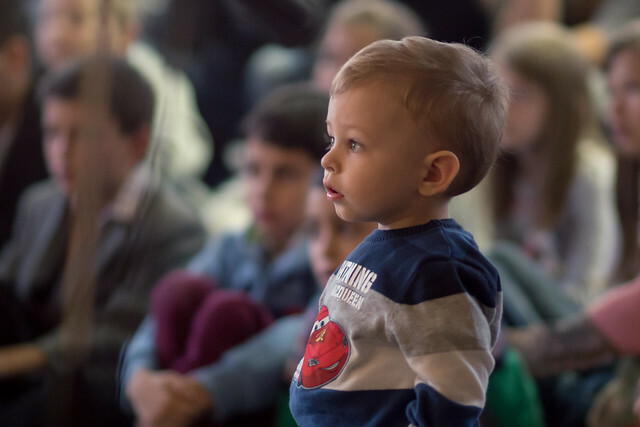 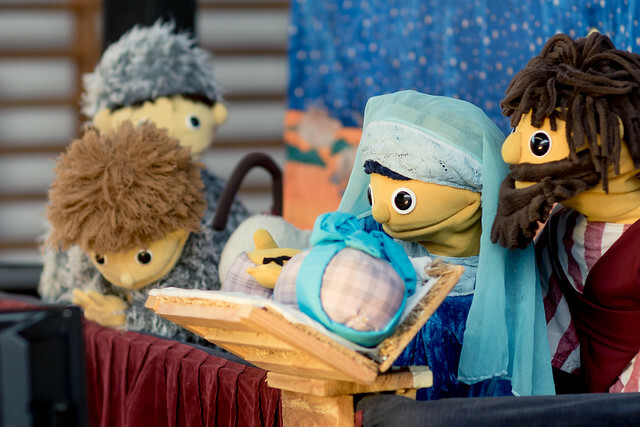 There were families that attended that we had not previously met and all of them were able to see the puppet show with their kids which allowed us to share the Gospel. 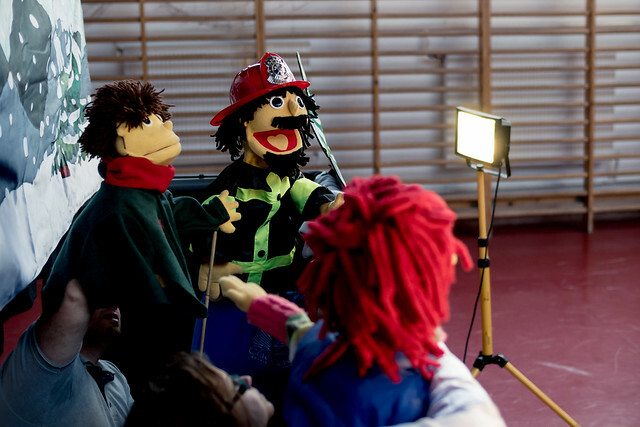 Above: After the puppet show, we set up a make-shift photo studio and we did free portraits for the families that attended. 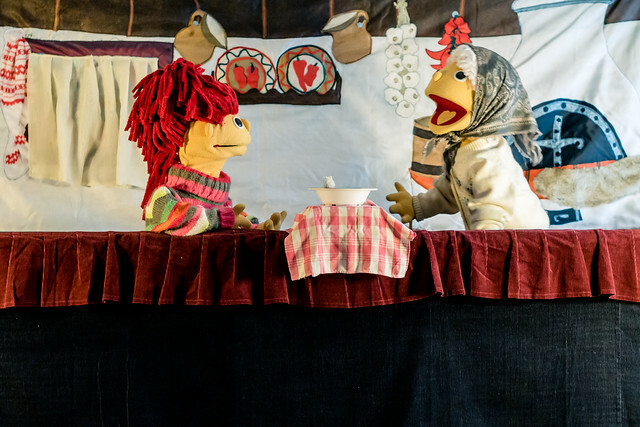 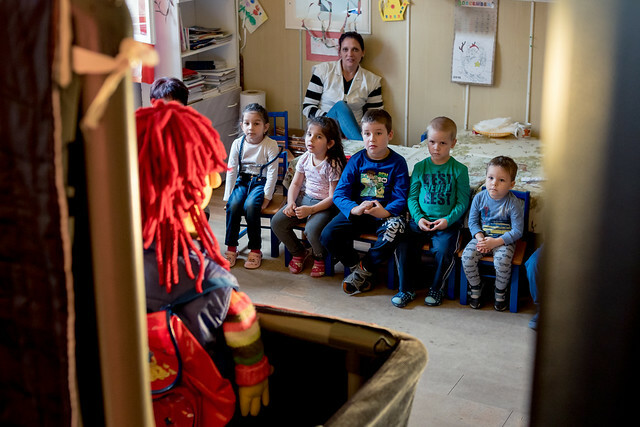 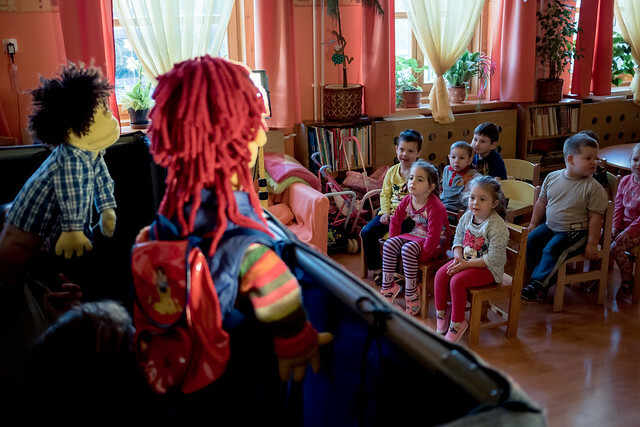 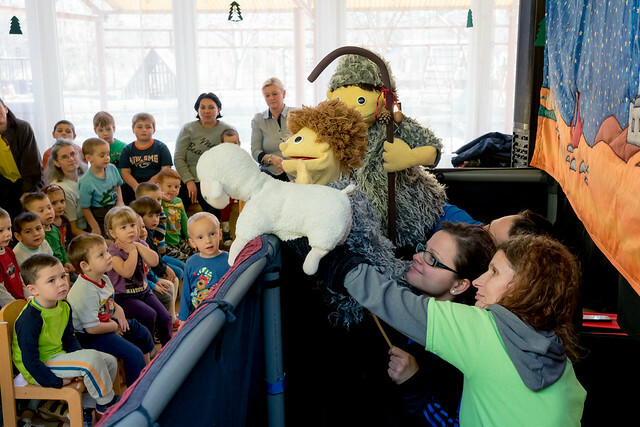 On Saturday we traveled to the town of Gyöngyös where we would be holding our puppet show in the local community center for families in the area. 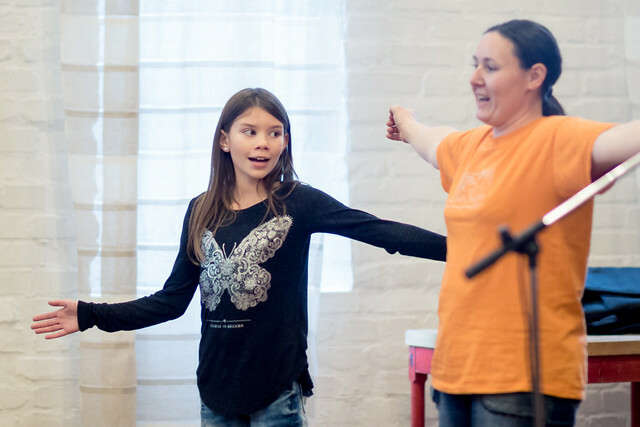 Above: Our daughter Kira with Zita helping out leading with motions and singing. 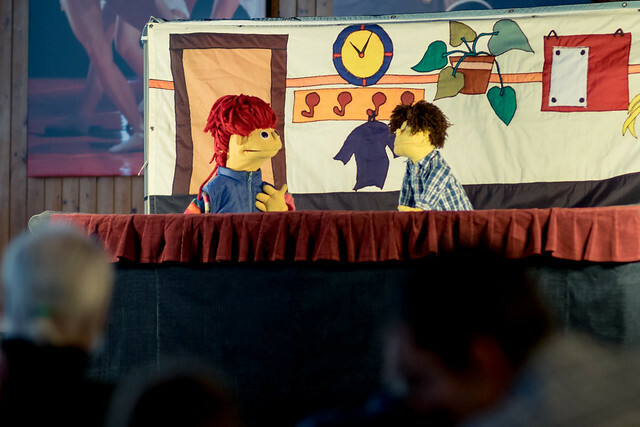 Above: Eszti sharing lessons learned from the puppet show and also sharing the gospel. 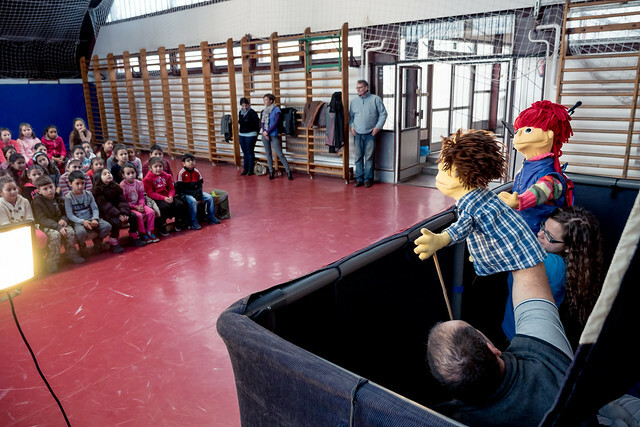 Above: Monday morning exercises before the kids fill up the auditorium. 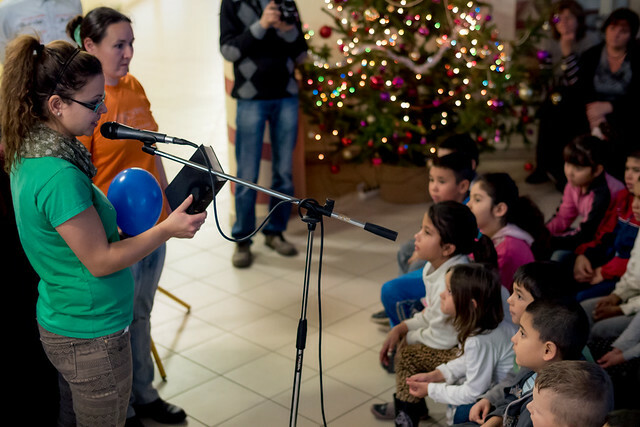 Above: As we talk with the kids before the show, Miki often asks the kids what we are going to celebrate in December. 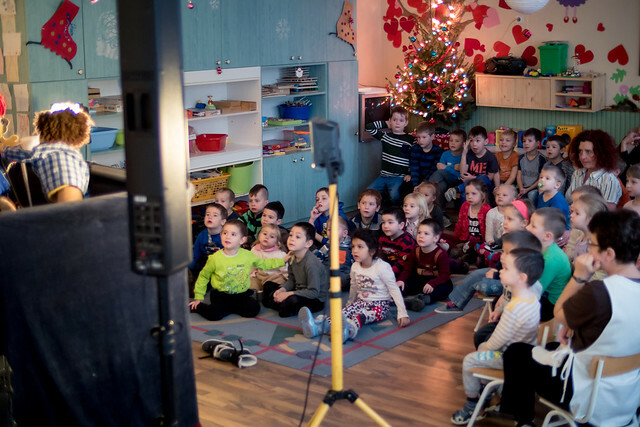 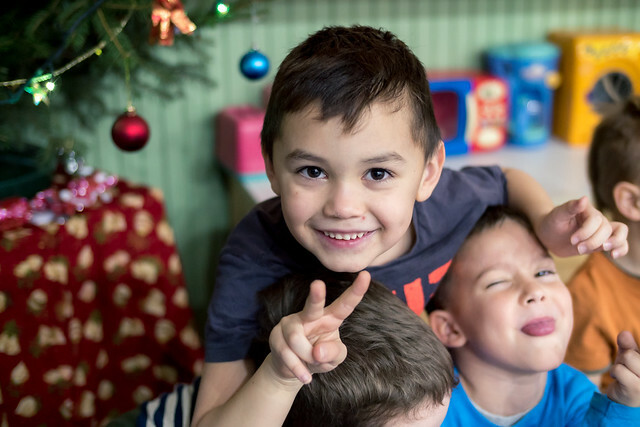 The kids all yell out, “Karácsony (kar-rah-chone)” which means Christmas. 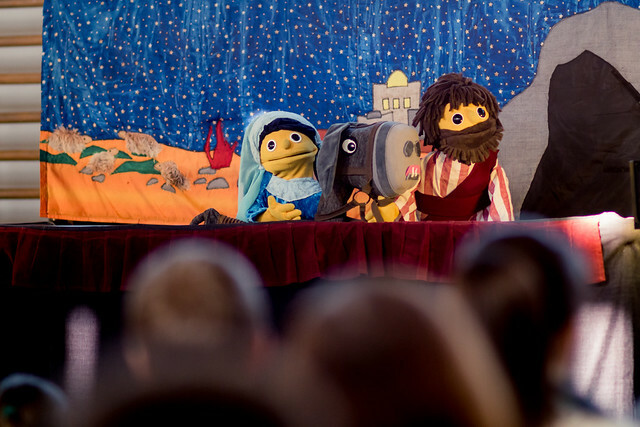 Then he asks them if they know the true meaning of Christmas. 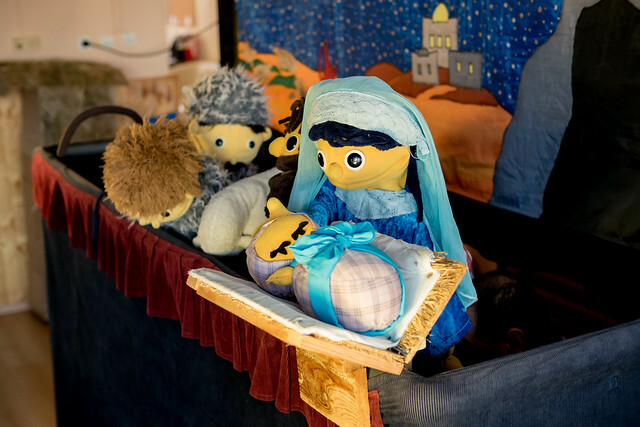 The girl sitting on the bench in the photo above on the far left excitedly shared, “Jesus was born”. 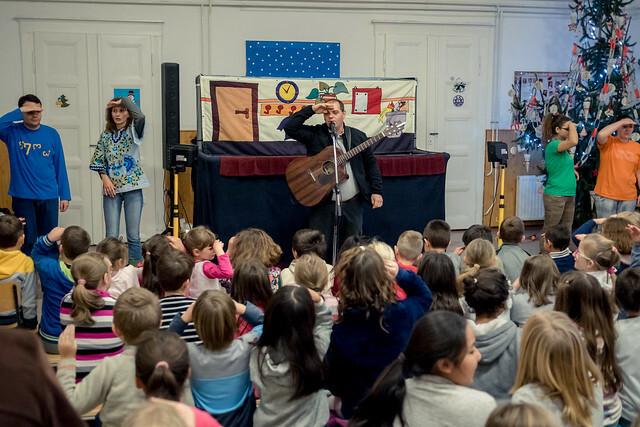 Then as Miki began sharing how Jesus grew up, he was interrupted by the little girl who said, “And He died on the cross and was risen from the dead!” Praise God for the seeds of the gospel taking root in these kids hearts and for them coming to understand more about our Lord and Savior Jesus Christ. 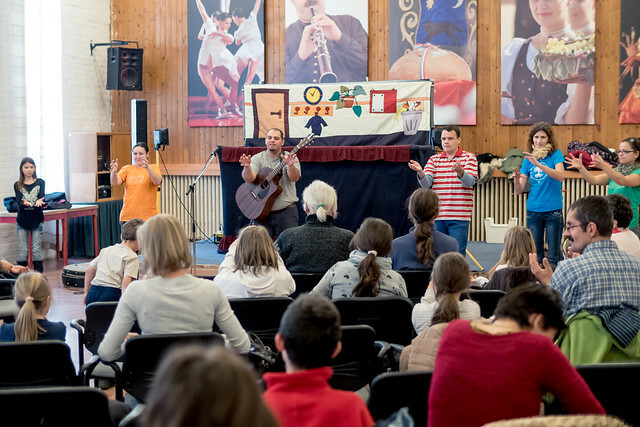 Our team has completed six days of performing in 10 locations. 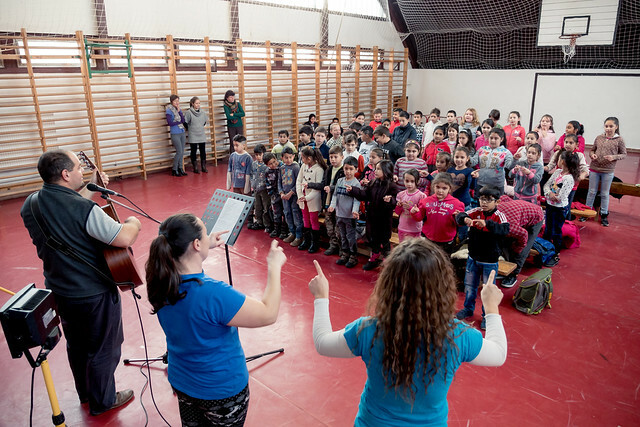 Praise God for His provision of strength, unity and ability to use this ministry to proclaim His gospel. 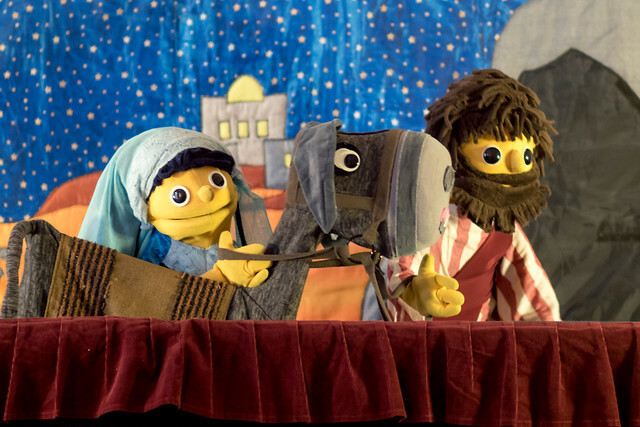 We have a pretty intense schedule over the remaining days of our Christmas Puppet Ministry. 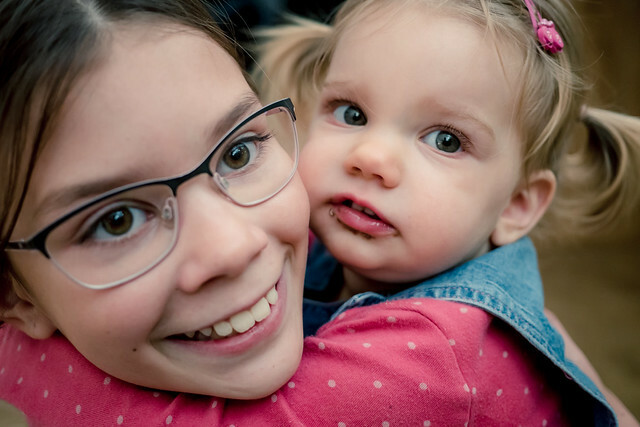 We would appreciate your continued prayers. 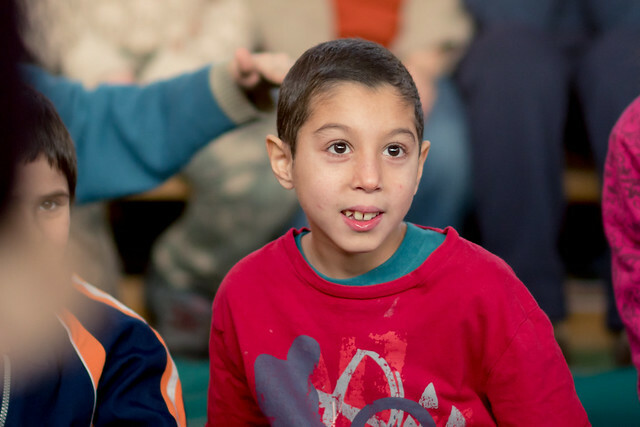 Some on the team are experiencing sickness (sore throat) and team member’s children are also suffering from sickness. 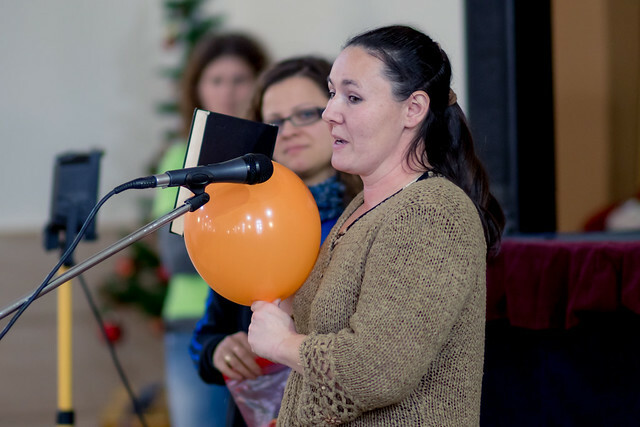 Please pray for healing and protection for the team and their families. 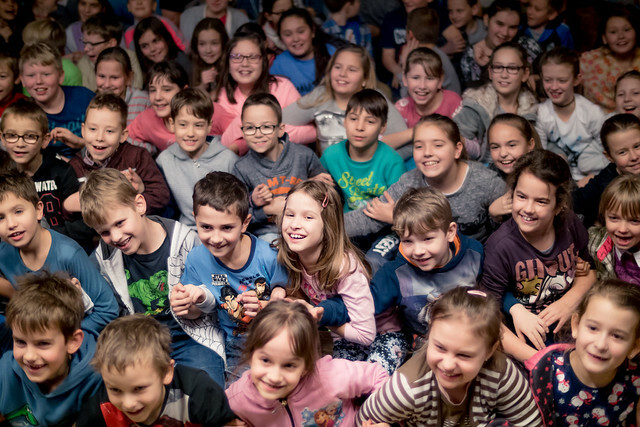 Praise God that we have had a good reception in every school we have visited and there have been absolutely no issues with distractions, technical issues, or car issues as we travel. 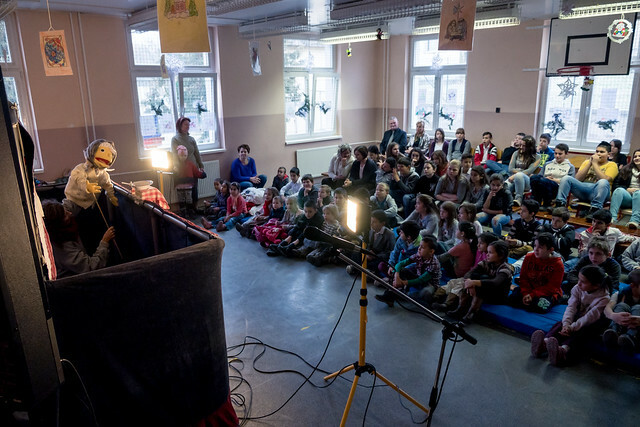 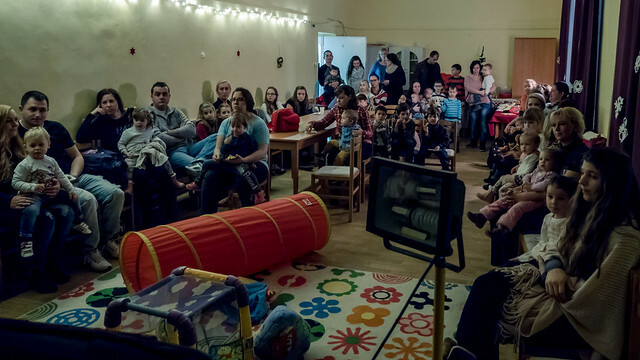 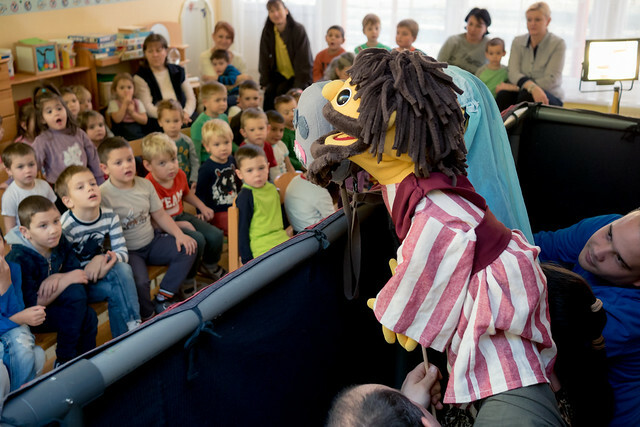 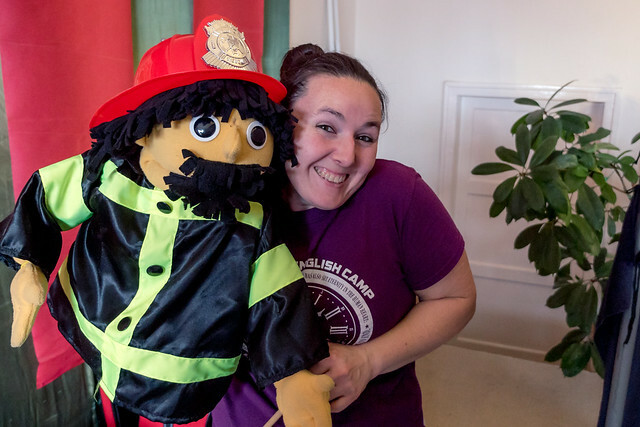 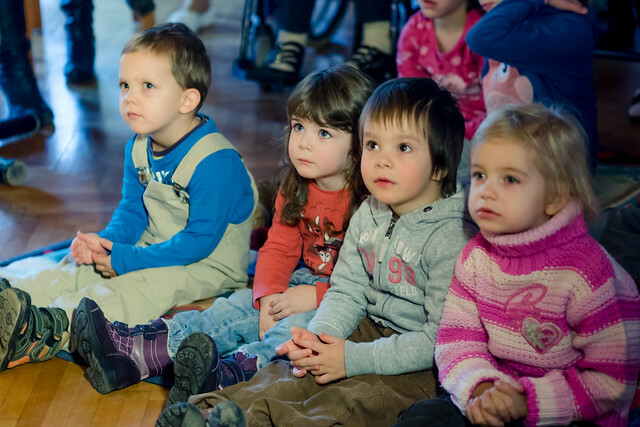 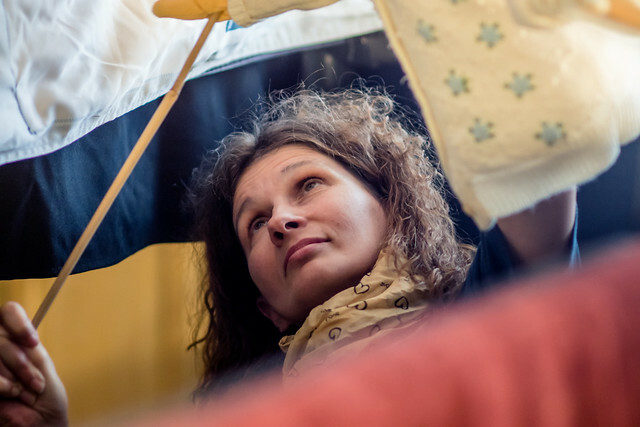 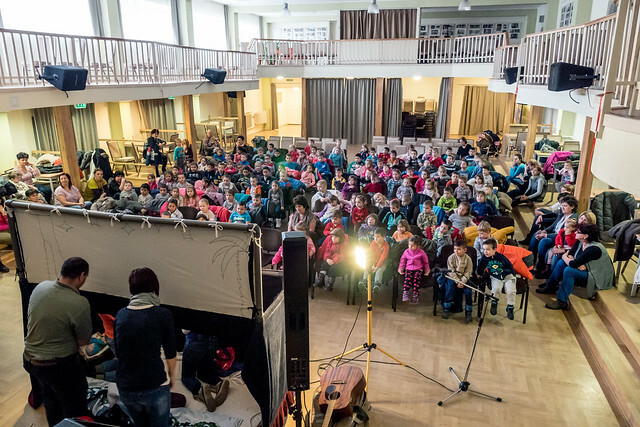 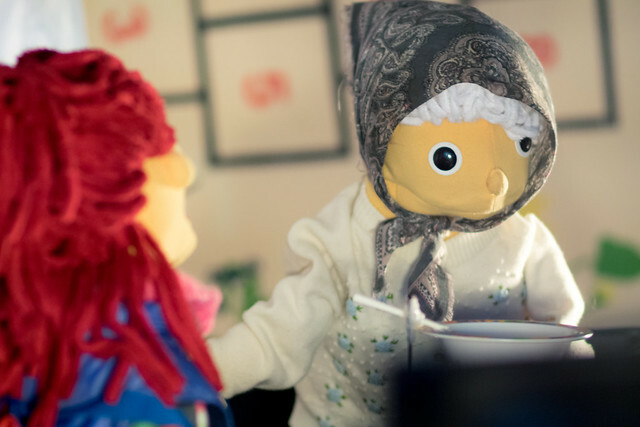 We held our first puppet show in the town of Jászfényszru last Sunday. 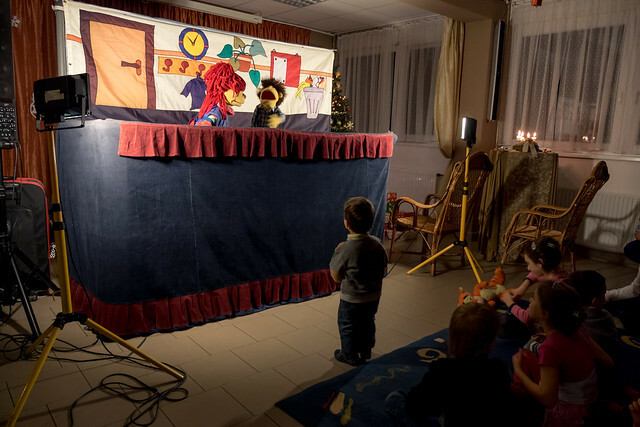 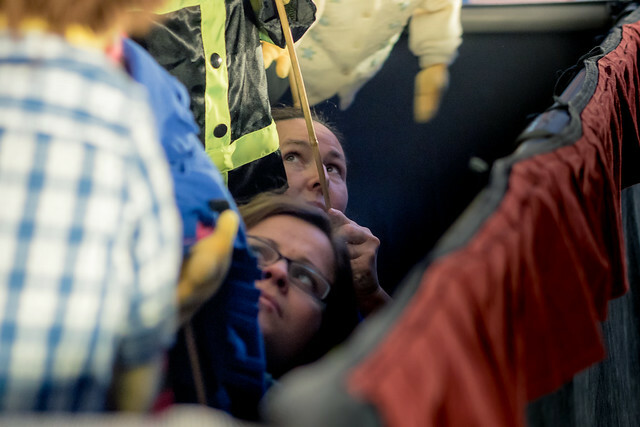 We built the puppet show into our monthly Children’s Playhouses meeting where we reach out to kids and parents in the community. 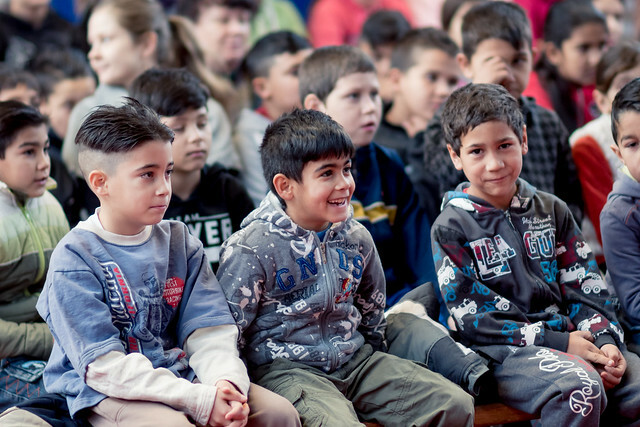 We had some kids who previously attended our English Club attend as well as their parents. 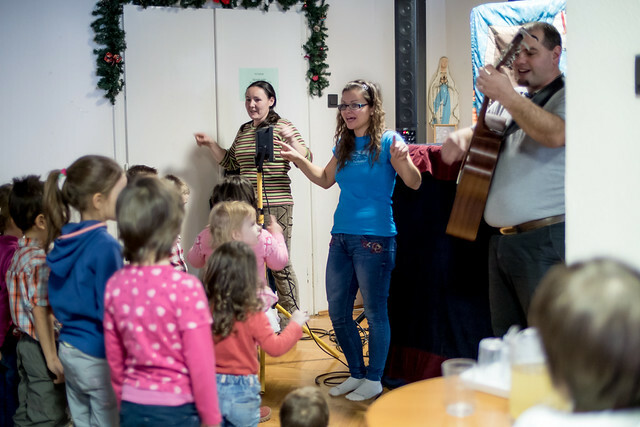 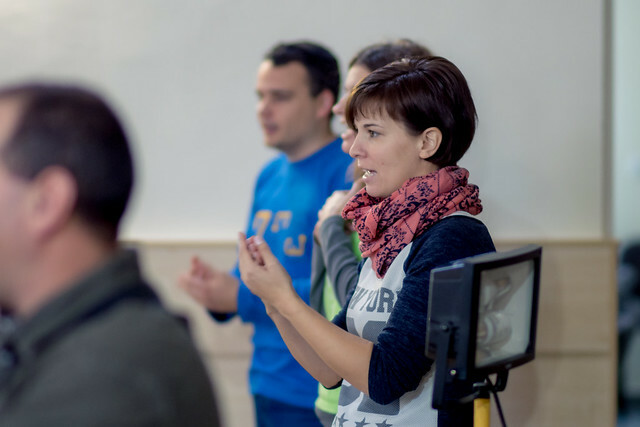 Also many of the core members form the church plant in Jászfényszaru attended and helped. 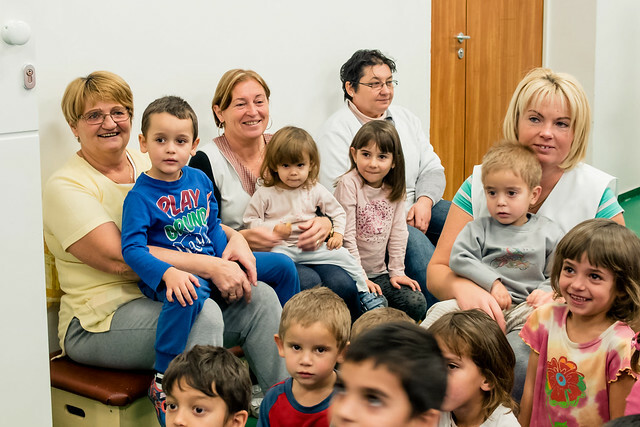 Above: Miki speaking with one of the parents who’s child also attended English Club and our VBS in Jászfényszaru. 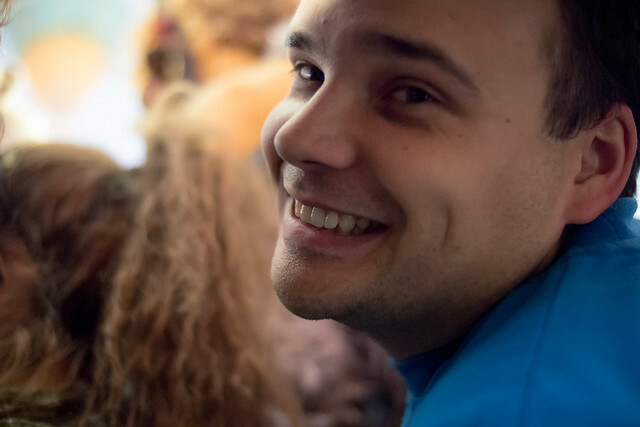 Miki was able to invite him to dinner with family and friends and will be meeting with their family sometime in December. 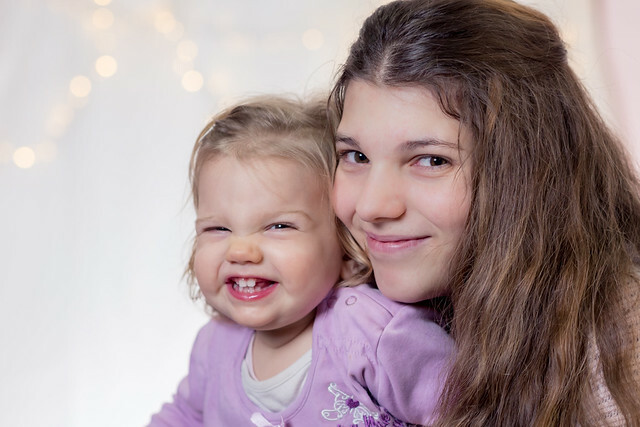 Above: Kira getting hugs from Miki’s daughter Naomi. 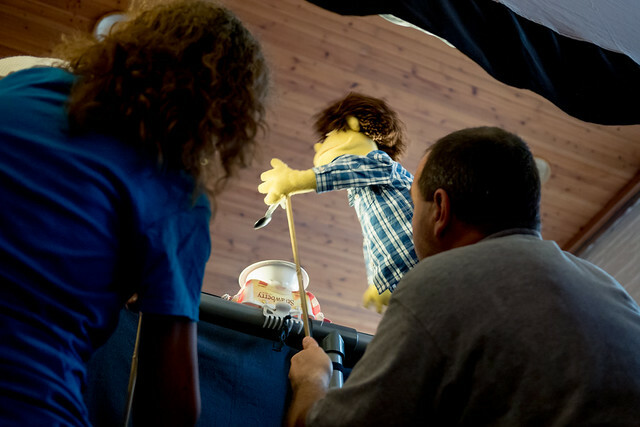 Above: Unpacking our trailer full of suitcases, props and sound equipment. 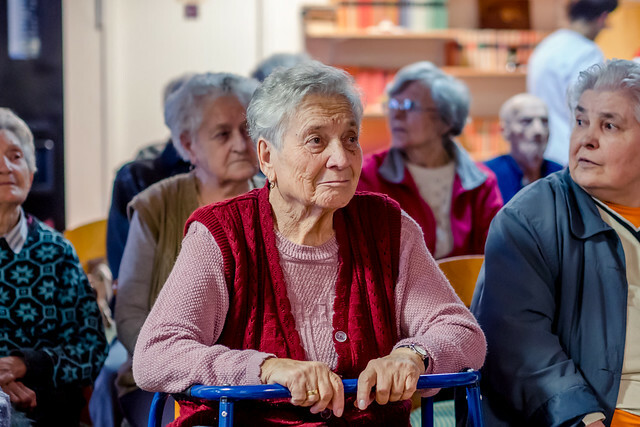 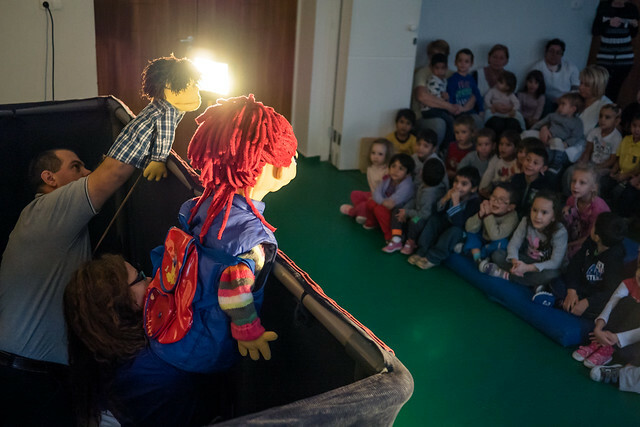 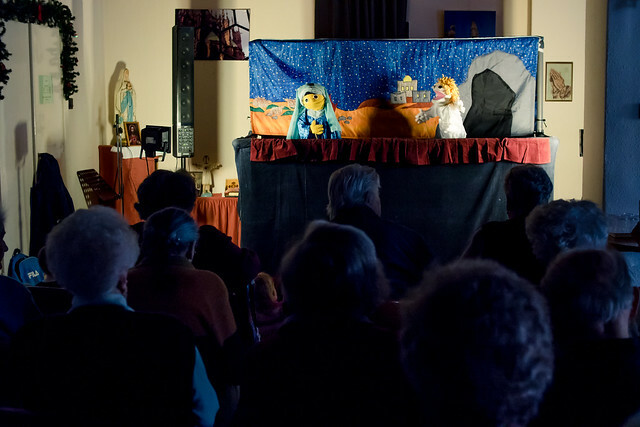 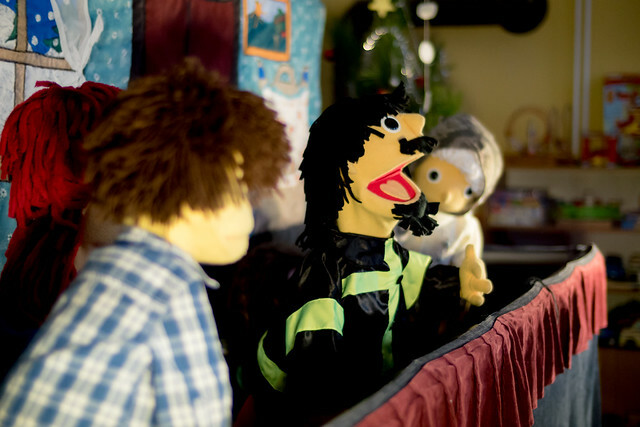 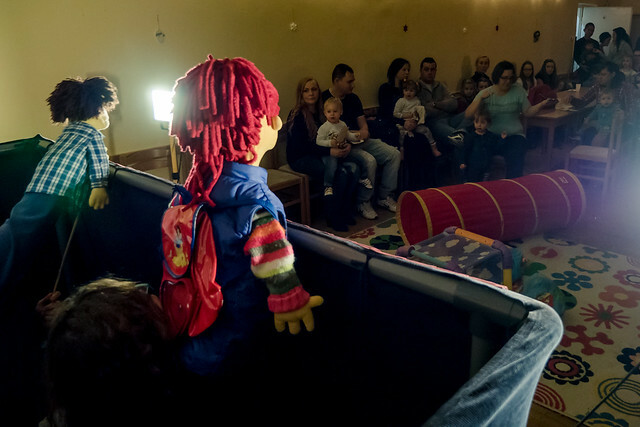 In Matrefured, we were able to serve both the young and elderly together as they gathered together in one room to see the puppet show. 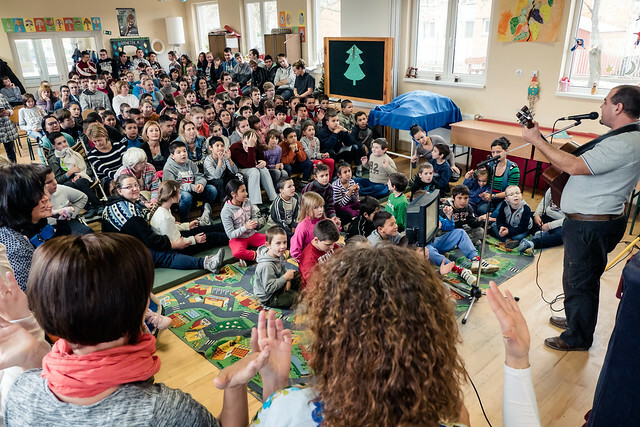 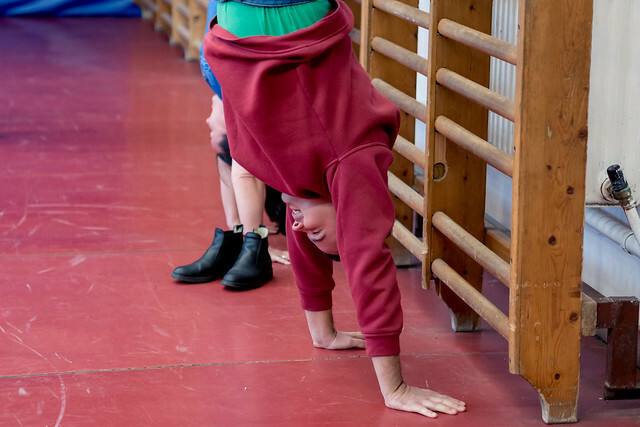 On Thursday, we took a forty minute commute out to Jászberény where we would be sharing with children and young adults in a special needs school. 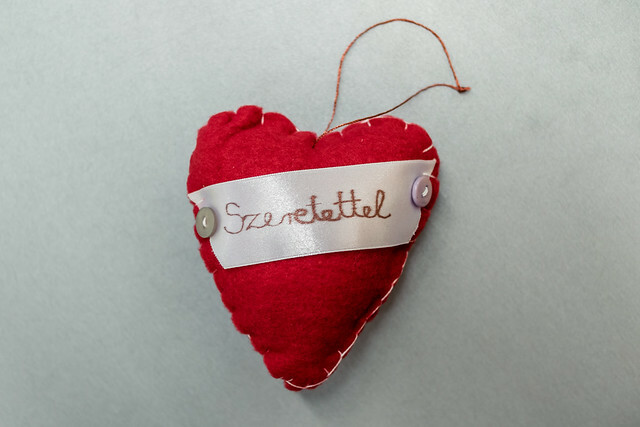 Above: After the show, the kids were kind enough to present each of us with these heart gifts that were hand made in their class. 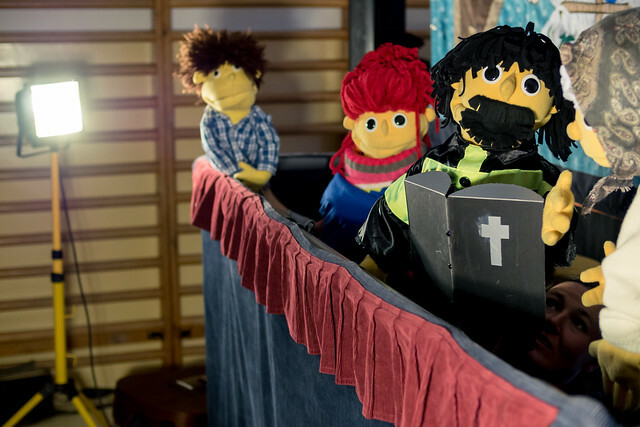 Praise God for these initial three days of our Puppet Outreach Ministry. 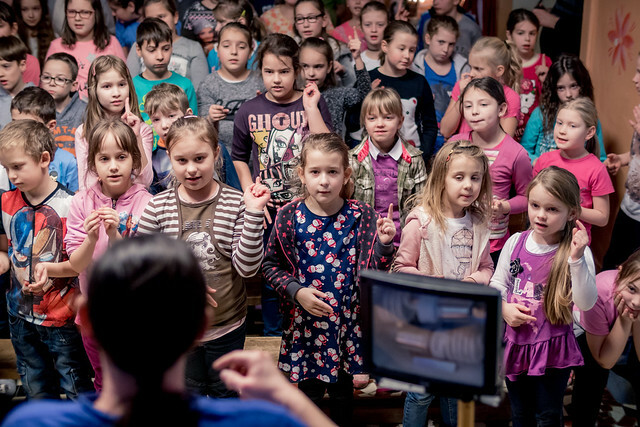 Praise God that He has continued to keep the door open to proclaim Jesus in public schools and allow us to distribute evangelistic material. 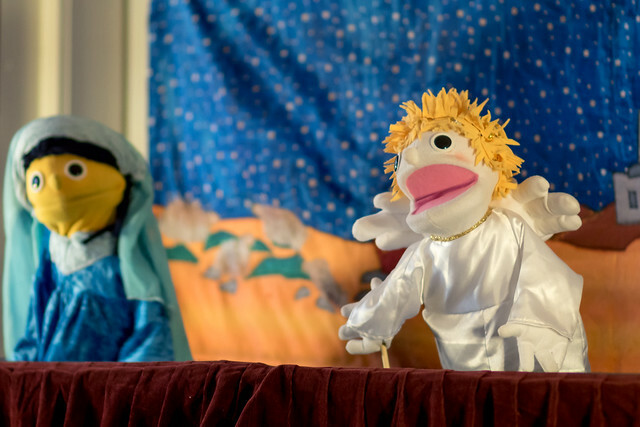 Please continue to keep us in your prayers as we have three shows tomorrow. 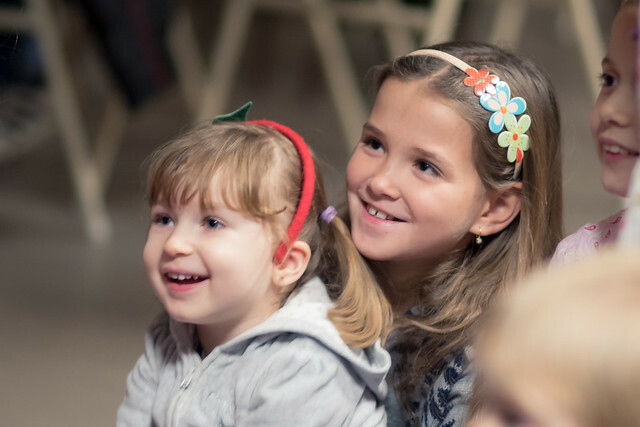 We will also be having a Christmas outreach tomorrow night for those that attend our church’s Mothers of Preschoolers Club. 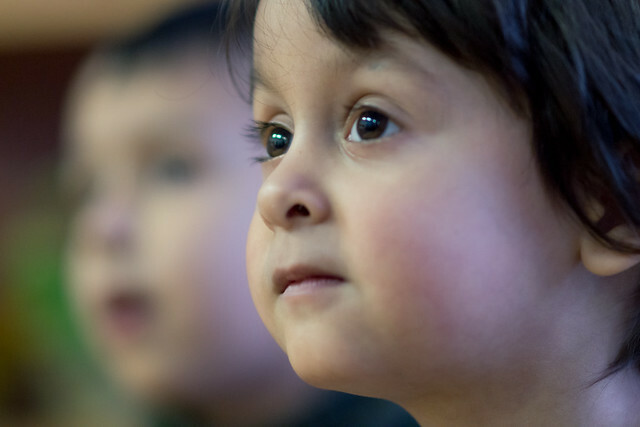 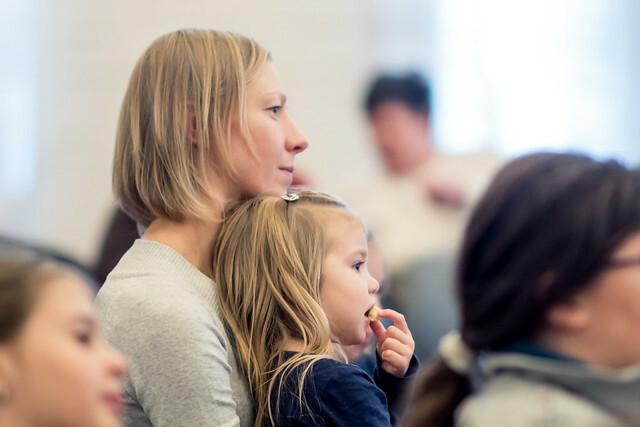 Please pray for open doors to continue to proclaim the Gospel to the parents that attend and for new connections to be made in our community.